Make something. Learn something. Go somewhere. Last month, we took a two week vacation to California. As I mentioned in my previous post 10 Must-Haves for Flying with a One-Year-Old, one thing that I always take on the plane is my iPad loaded with in-flight entertainment for my little guy. I seriously don’t know how my 22-month-old and I could do the cross-country flights without it! I have spent the past couple of months downloading tons of new apps and having Tommy try out one or two a day. Because I let him use the iPad not only for flights (when he is sitting on my lap), but also when I need a moment to cook dinner, check my e-mail, or run to the bathroom alone, I look for apps that will hold his attention for an extended period of time. I also try to find apps that he can navigate on his own with little to no help from Mommy so that if I am busy, he won’t be whining for me to come over and help him if the app freezes up or if the app is too complicated for him to use without help. We do also enjoy snuggling up and using the apps together. Most of the apps that I download for him are learning apps, and I love to work on them together with him or to at least be close enough to watch so that I can see how he’s learning and growing. After a lot of trial and error, I have added some really awesome new apps to our handful of tried-and-true apps that he has been using since he was about a year old. This is one of the first apps that I ever downloaded for Tommy when he was about a year old, and he has always enjoyed it. 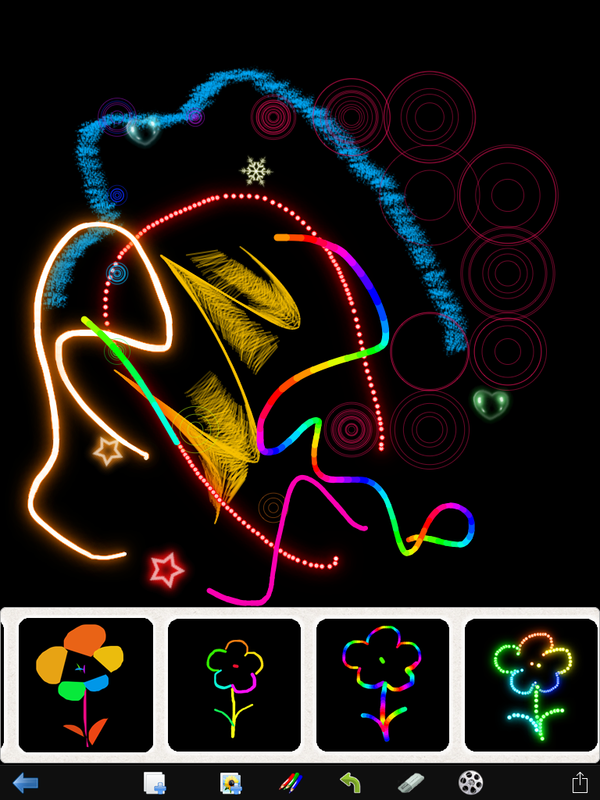 It’s a drawing app where he can use his finger to scribble a design, but the black background and neon colors make it more fun than old fashioned pen and paper. Now that he is a little older, he is using some of the more advanced features, like changing the brush style, watching the movie play back of this drawing steps, and drawing on top of photos from the camera roll. 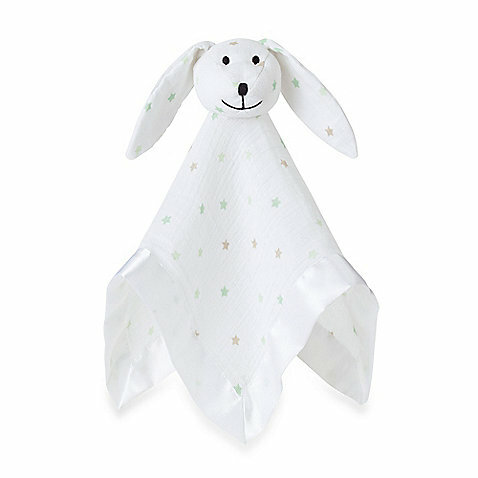 It’s simple enough to entertain a one year old, but has enough to it that I think he will enjoy this one well into his toddler and preschool years. 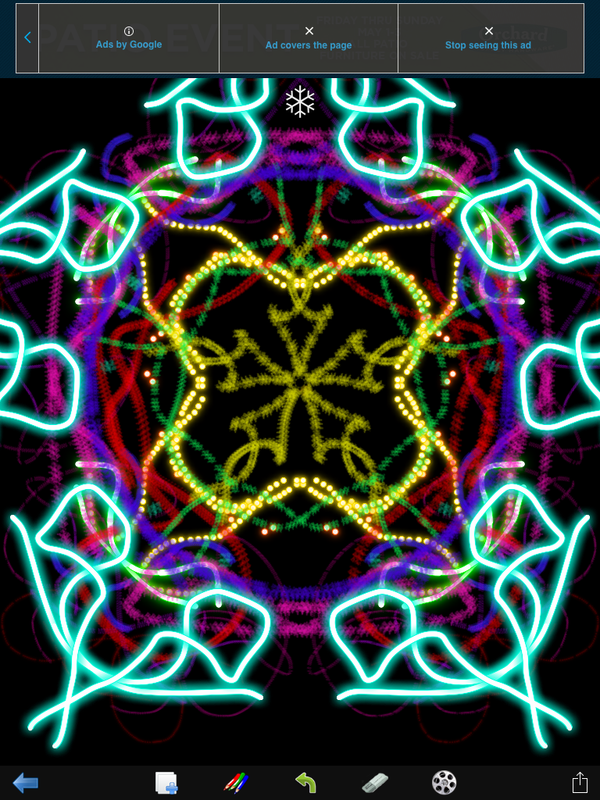 Very similar to Kids Doodle, but this one makes beautiful symmetrical designs with the tap of a finger. Tommy loves watching the bright colors change and watching the replay videos. 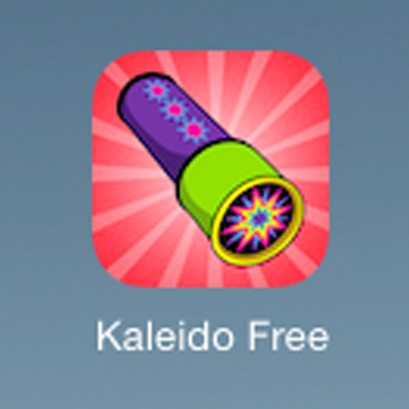 He also likes to switch between the 8 kaleidoscope modes and 10 brushes to get new effects. 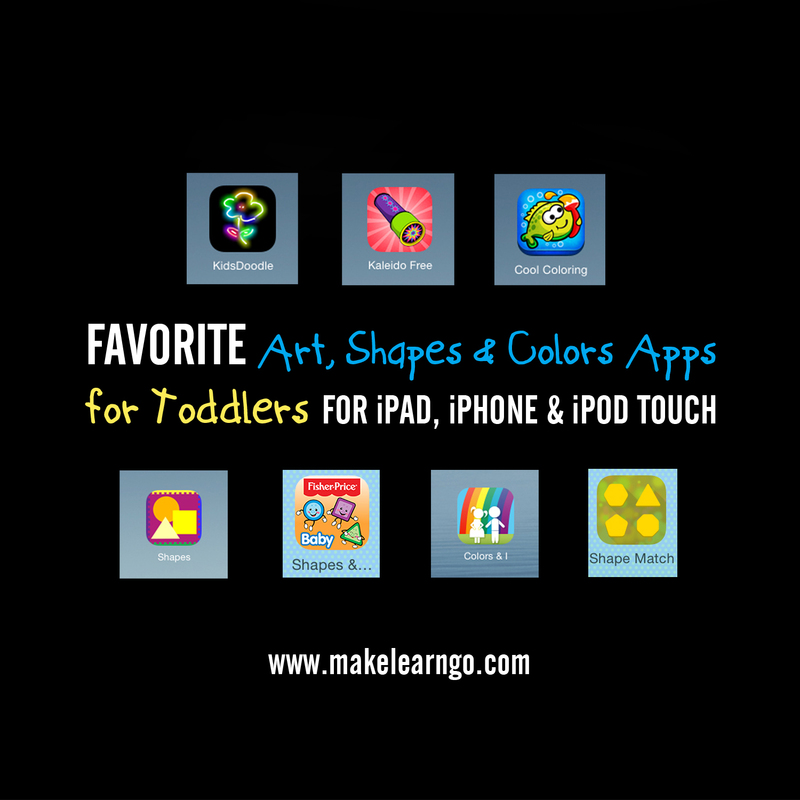 Fun app for babies and toddlers! 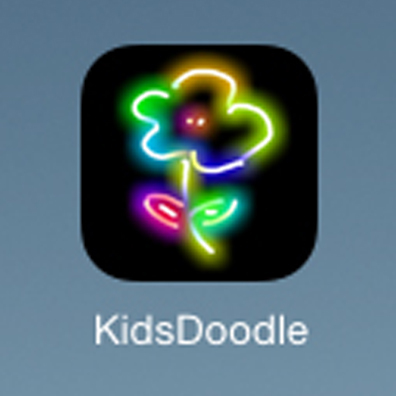 I was really surprised how long it took us to find a coloring book app that we liked. 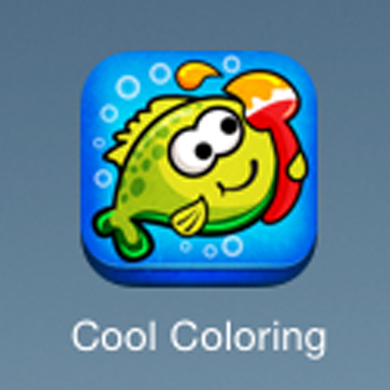 Most of the coloring book apps that I found have lots of ads, in-app purchases, and locked images. Tommy would get so frustrated with them and was always clicking links that took him out of the app. I love Cool Coloring because it has a variety of cute, simple images to color, is super easy for a toddler or baby to use, and has a pretty texture over the images that is nice. 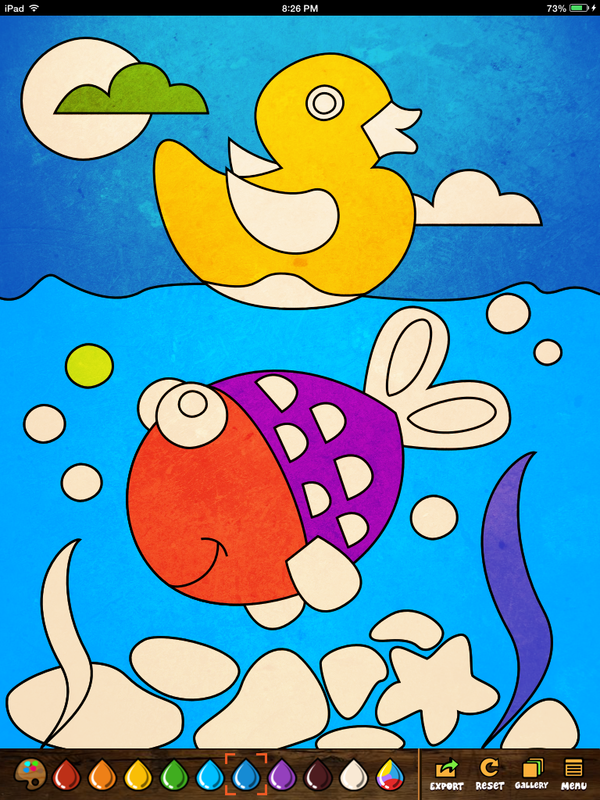 I like that you only have to tap on an area and it fills with color- some of other coloring book apps require you to actually scribble the color in and that is too hard for a one or two year old to do on their own. I also like that you can turn on fun music to listen to while coloring. 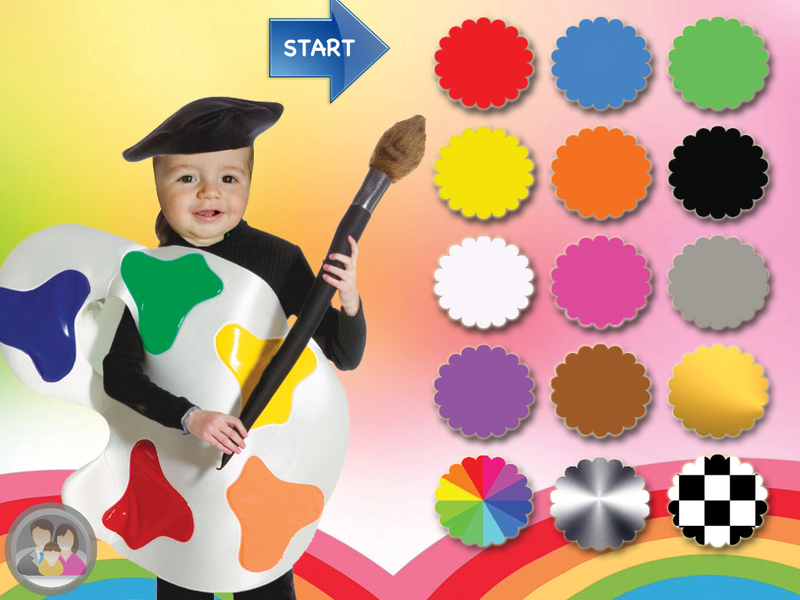 Another great thing about this app is the rainbow colored paint drop that you can select- it automatically changes the color every time you tap it so that the kid doesn’t end up coloring the entire image one color each time. 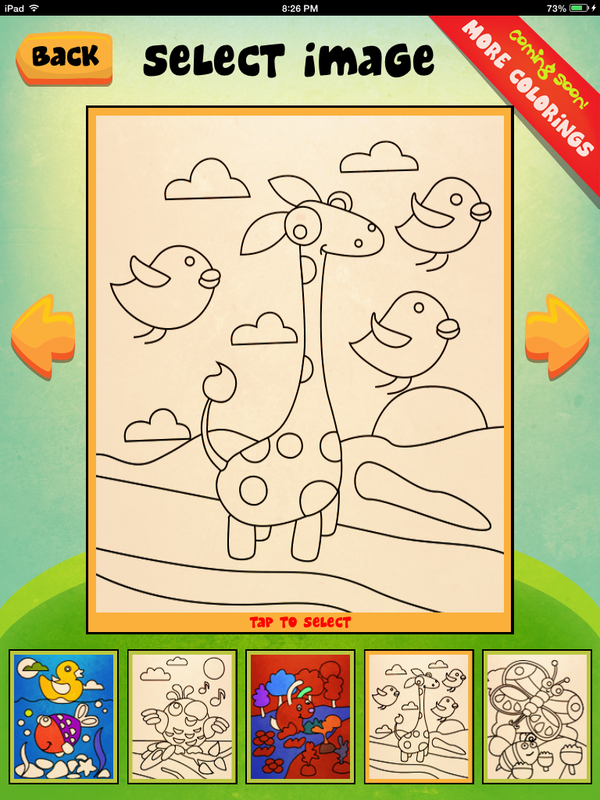 Best free coloring book app out there, hands down! 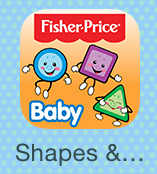 This was one of Tommy’s first favorite apps. 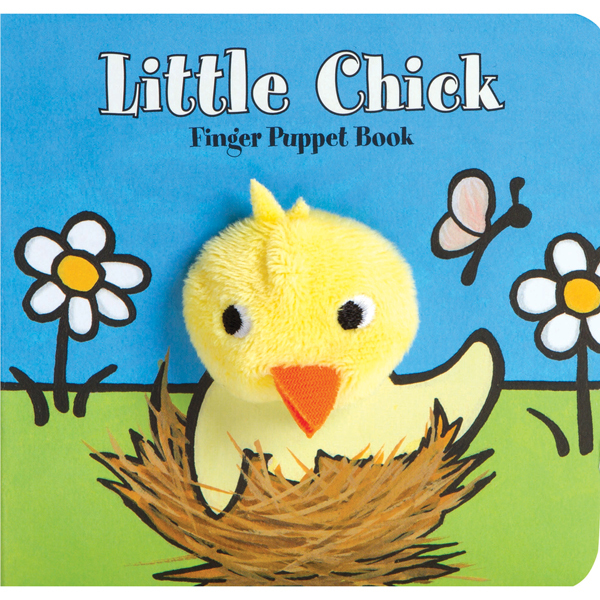 There are two different levels and both are cute and fun (especially for one-year-olds). Level 1 has five fun little shape characters (blue circle, yellow star, etc.) that pop up when you tap the screen. 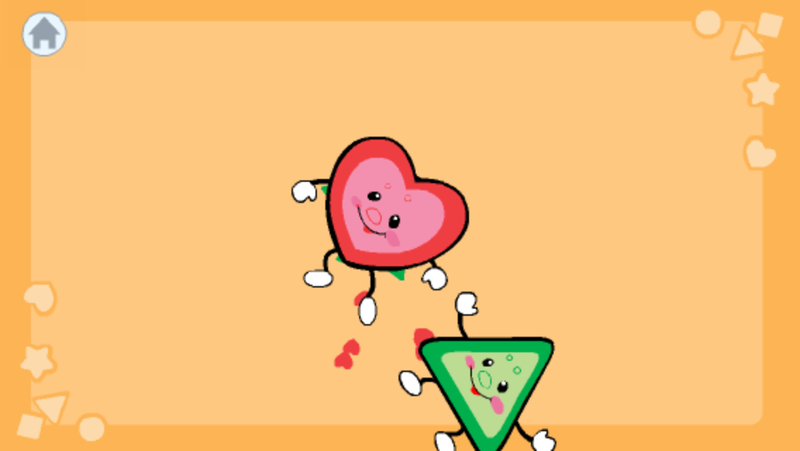 When you tap one of the animated shapes and drag it around the screen, smaller shapes will trail behind it, music will play, and a cheery voice will tell you name of the color and shape. Level 2 has all five shape characters up on a stage. 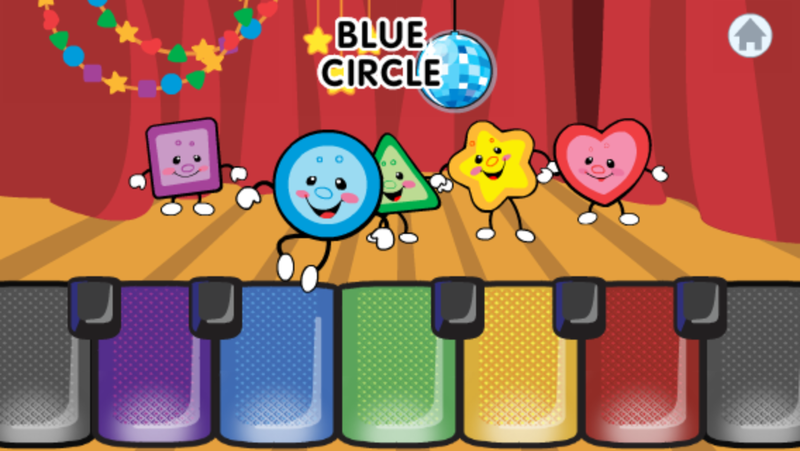 When you tap on a character, it will step forward and dance to a fun song about its shape and color. After you have tapped the characters a few times, the curtain comes up and they all sing and dance together. 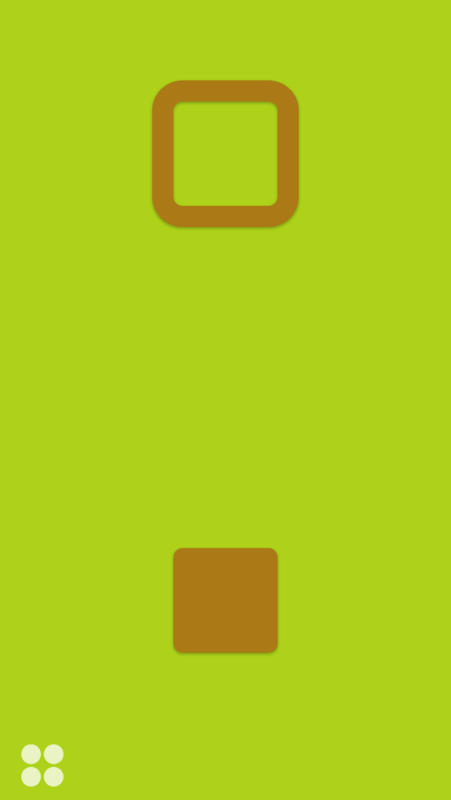 There is also a little piano at the bottom of the screen that plays notes when you tap it. 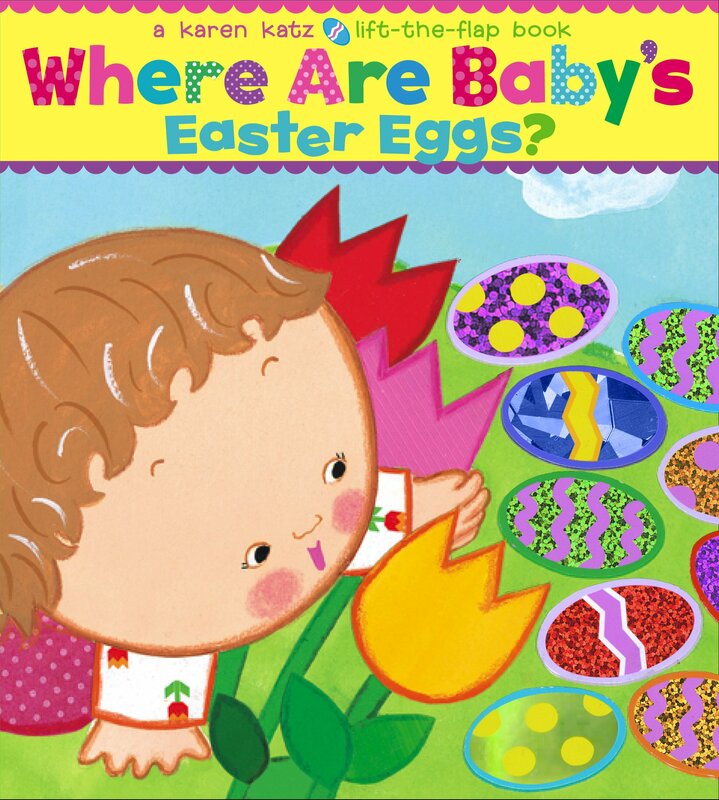 Very cute and fun, and a perfect first app for babies! Another awesome (and free!) 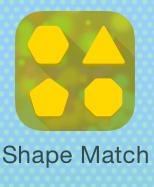 app for learning shapes. 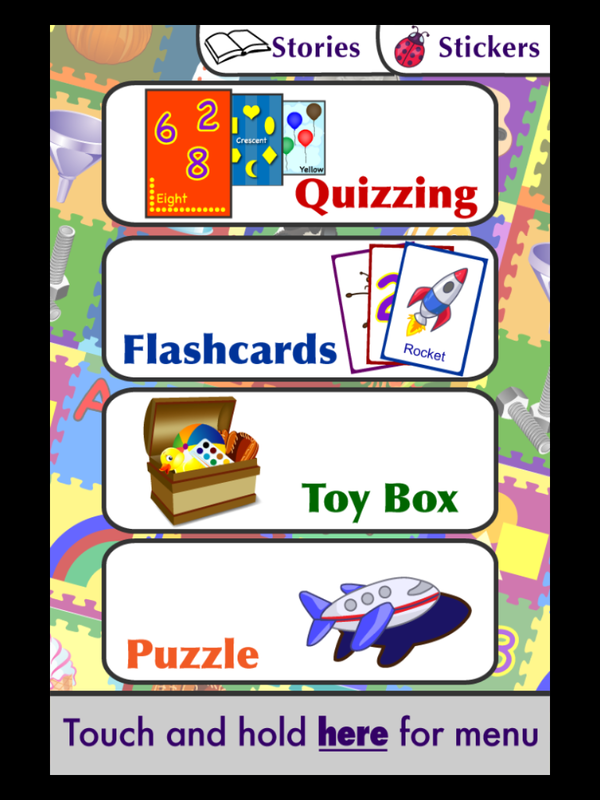 This one has flashcards, quizzes, games, and puzzles to help kids learn their shapes. They can practice recognizing their shapes by viewing the flashcards and hearing the name of the shape, then the quiz will ask them to “find the (circle, crescent, triangle, etc. )” among other shapes. When they tap the correct shape, they will hear cheering, and after a few right answers in a row, they get to choose a “sticker” to add to their sticker collection. 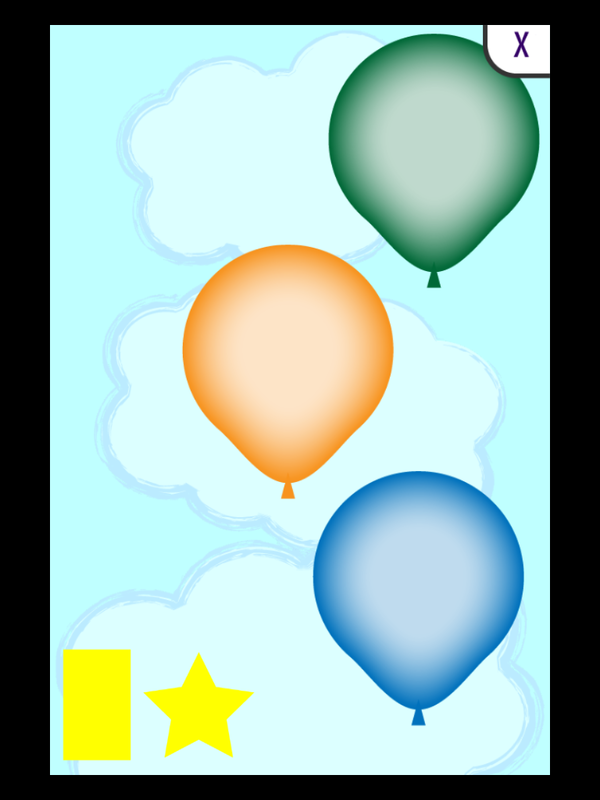 There is also a “Toy Box” game where they get to pop balloons to reveal shapes, launch shapes out of a cannon, build a train with the various shapes, and build a block tower with the shapes. 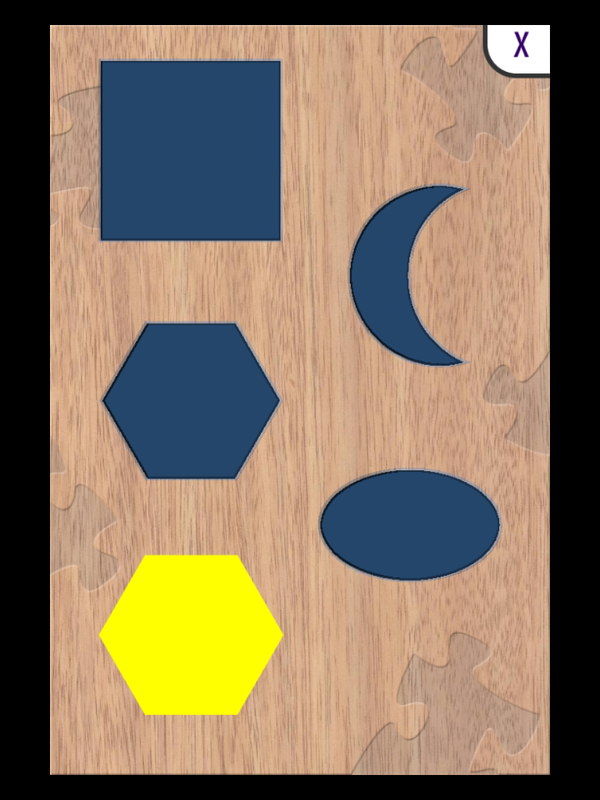 The “Puzzle” option brings you to a shape sorter where you match the shapes to the matching negative spaces in what looks like a wooden board. 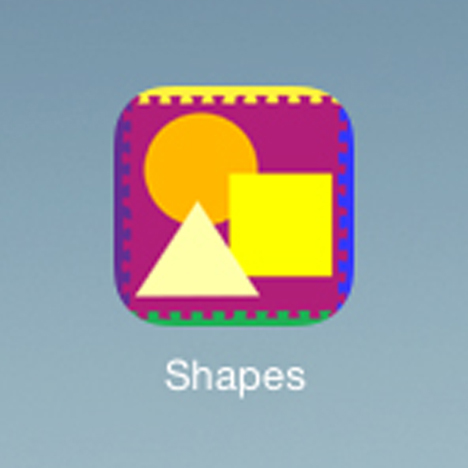 There is also an option on the top of the homepage for “Stories,” where there are little mini eBooks about shapes. (In all honestly, this is the one part of the app that Tommy is not interested in at all.) 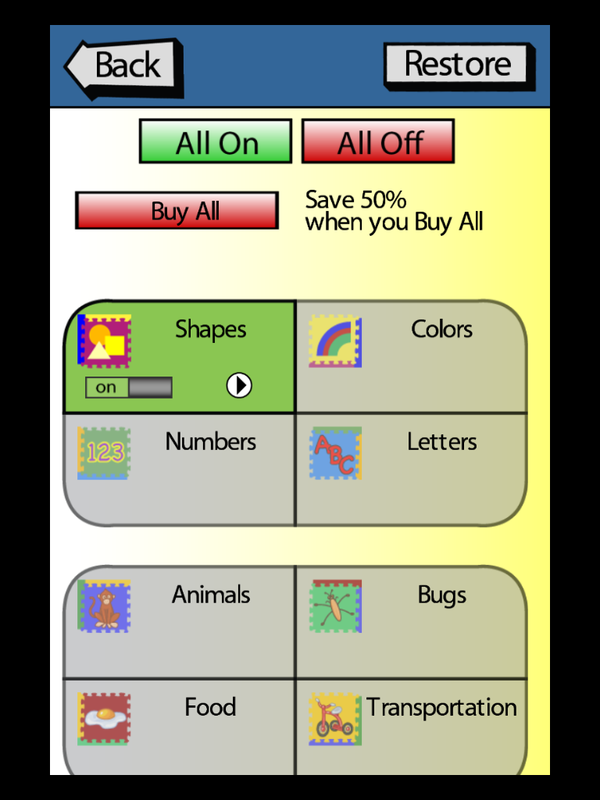 This app also has great options in the adults only section: you can change the language to English, Spanish, or French; buy 29 more categories to learn (including colors, letters, numbers, animals, food, musical instruments, and money- just to name a few! 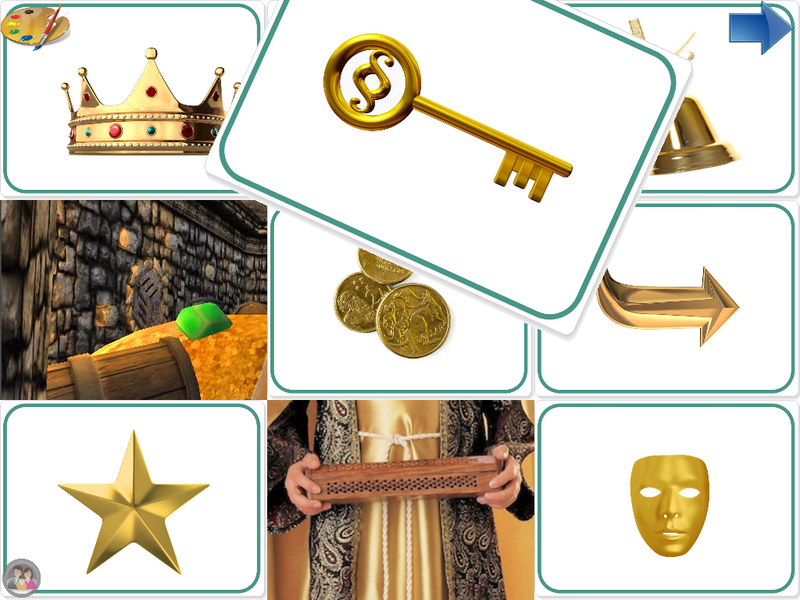 ); change the theme of your reward stickers (picnic, underwater, or robots), and see a “report card” showing which shapes your child is getting right most of the time and which ones need more practice. There is SO much included in this app for FREE, and paying $3.99 to add the other categories is really a great deal. It’s so exciting to see when he is asked “find the octagon” and he picks it out among 5 or 6 other shapes! This app is really only worthwhile if you pay for the upgrade. 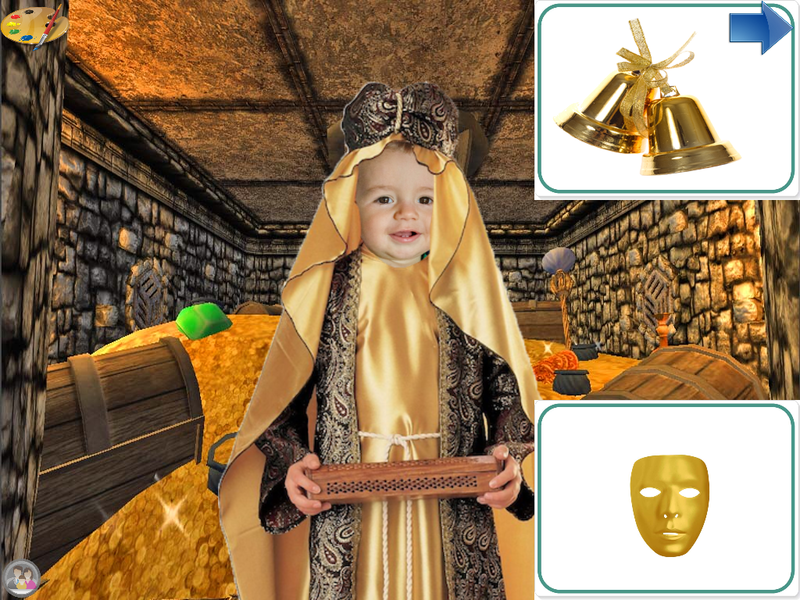 The free version uses a default child’s image, but with the full paid version of this app, you can upload your child’s photo and they will burst into giggle fits when they see themselves inserted into all sorts of silly scenes wearing costumes of different colors. 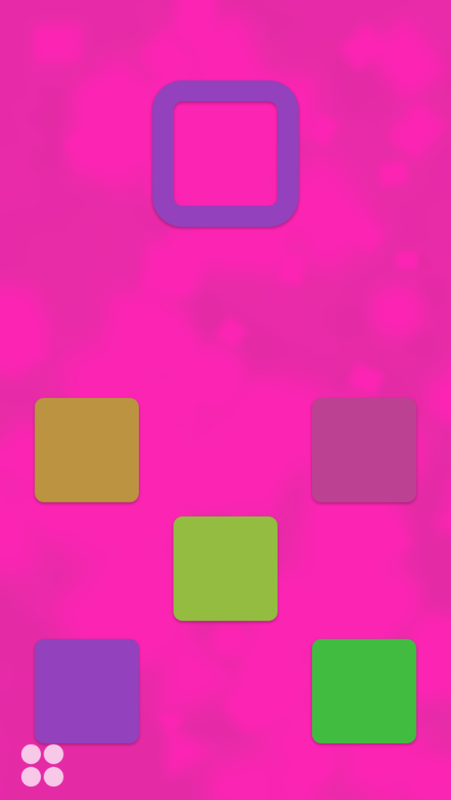 You can choose between 15 different colors and it will display a screen covered in 9 cards with objects of the selected color. 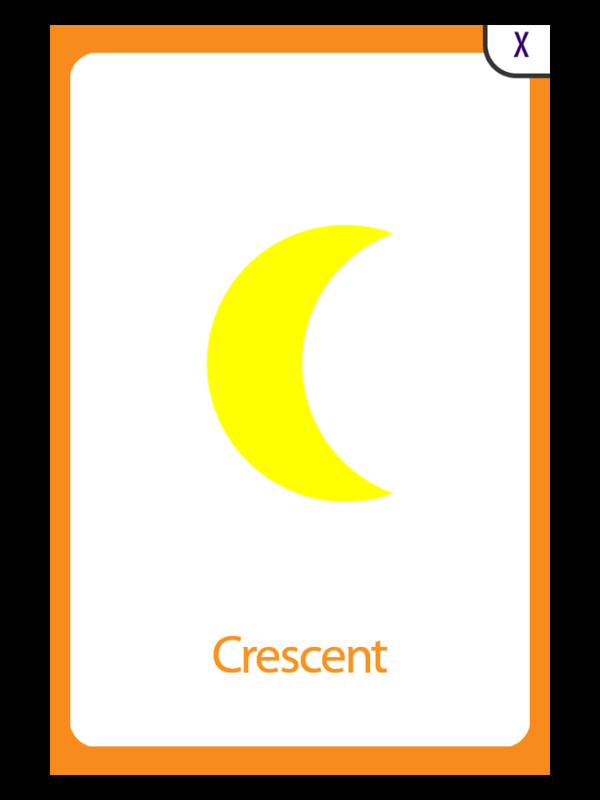 As you tap the objects, it tells you the name of the object and the card is lifted away to reveal part of the image underneath. 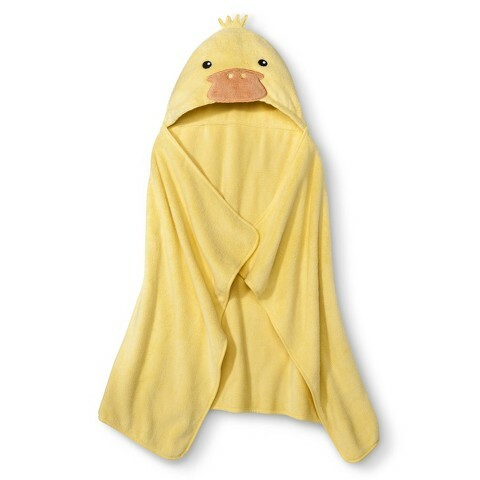 The revealed image is a scene of the selected color with your child wearing a silly costume in the same color. 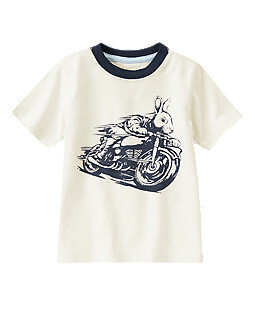 There are over 50 unique costumes with different options for girls and boys. This app is so much fun, and Tommy’s 3 and 5 year old cousins couldn’t get enough of it, either. 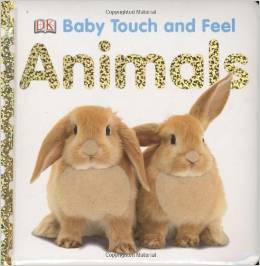 I like that it not only teaches colors, but also teaches over 100 vocabulary words with corresponding images, which is awesome for babies and young toddlers who are learning to talk. As I have mentioned before, Tommy LOVES puzzles, so this app was a hit with him right away! 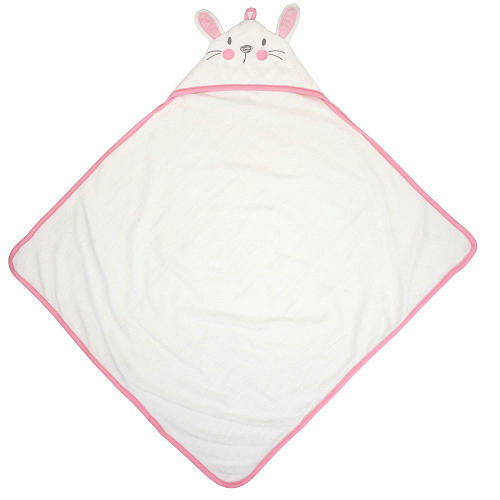 The game is set up like a shape sorter puzzle, with a shape’s outline shown at the top of the screen and a smaller shape below that the child taps and drags over to fit inside of it. 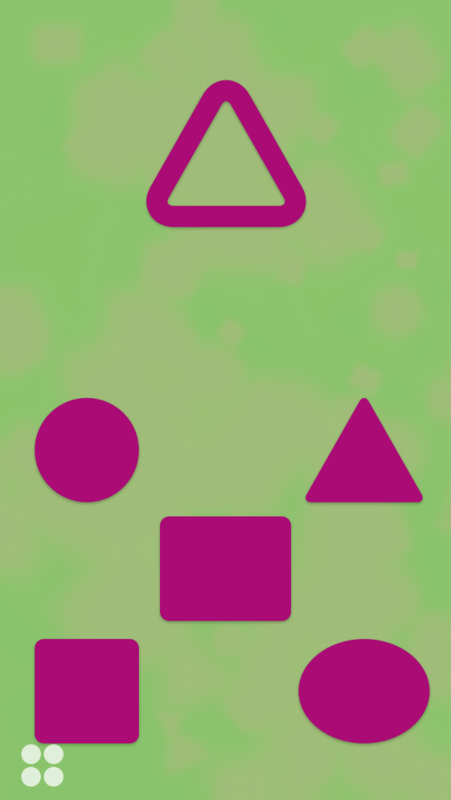 As the child progresses through the levels, it gets more difficult- additional shapes are added in to make it harder to find a match, and various colors are added so that the child has to match not only the shape, but also the color. The app has music and sound effects (that can also be muted). The graphics are simple, but bright and engaging. I appreciate that this app has no ads or in-app purchases, and there is a “parents” section with news, upgrades, and support that can only be accessed by holding down your finger for 5 seconds. It’s so great to find apps that are easy for my just-turned-two year old to navigate and play without being constantly led out of the app by pop-ups and links. This app was clearly developed by a parent of a young child for parents of young children. I also love that this app teaches him shape recognition, color recognition and matching, and helps to sharpen his visual perceptual skills. It has quickly become a favorite app of Tommy’s, and would be a great addition to the app collection of any toddler or preschooler! Do you have any favorite art, shapes, and colors apps that I should know about? Share in the comments! Or just download these ones, try them out, and let us know what you think about T’s favorites! Don’t forget to check out our Favorite ABC & 123 Apps for Toddlers, our Favorite Puzzle and Sorting Apps for Toddlers, and our Favorite Games & Video Apps for Toddlers. * To Gralla and Sweet Marie: Sorry if you see this blog post before your Mother’s Day package arrives and it spoils the surprise! 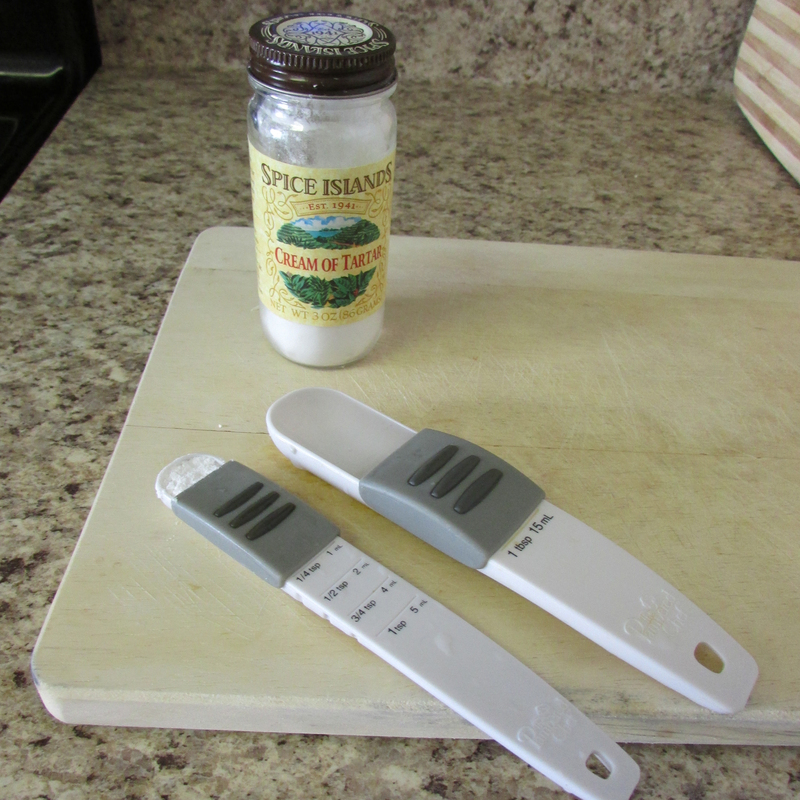 Fabric paint – yellow, black, & white for the bees, green for the flower stems (we chose permanent fabric paint that is dimensional but not puffy, and comes in a small tube with a pointed tip for detail. 1. Grown-up: From the sponge, cut out a small circle (about the size of a quarter) and a longer petal shape to make your stamp for the flower. 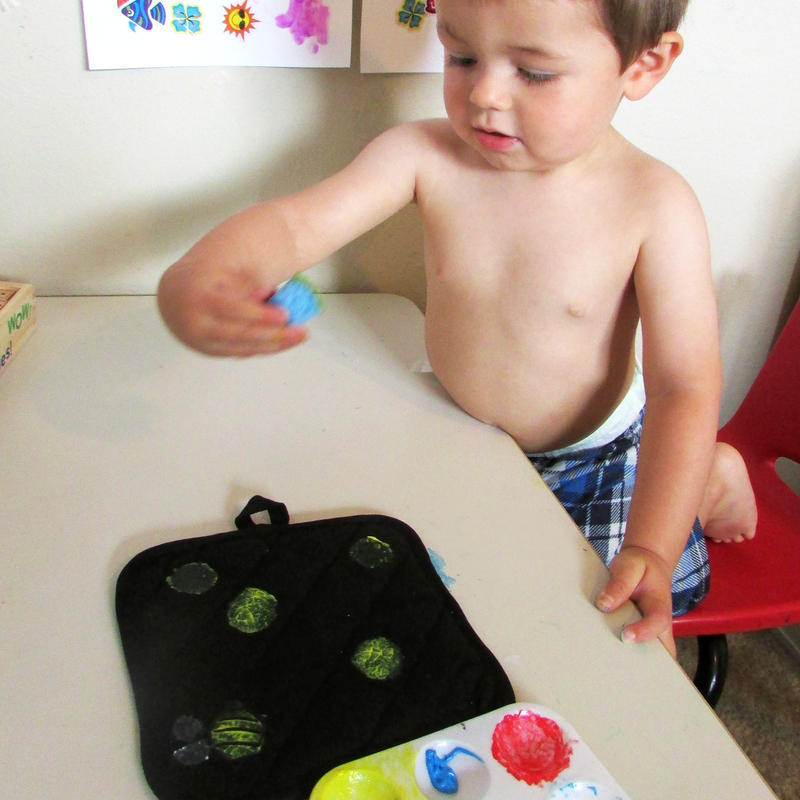 Cut out another quarter-sized circle and a small wing shape to make your stamps for the bee. 4. 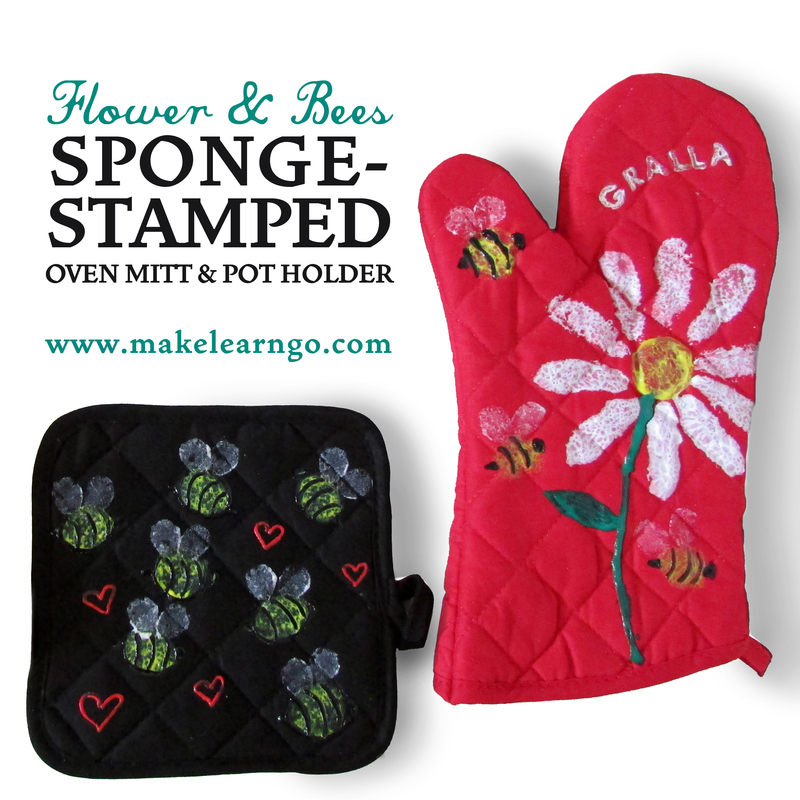 Child: Repeat steps 2 & 3 with the petal-shaped sponge stamp and a different paint color. 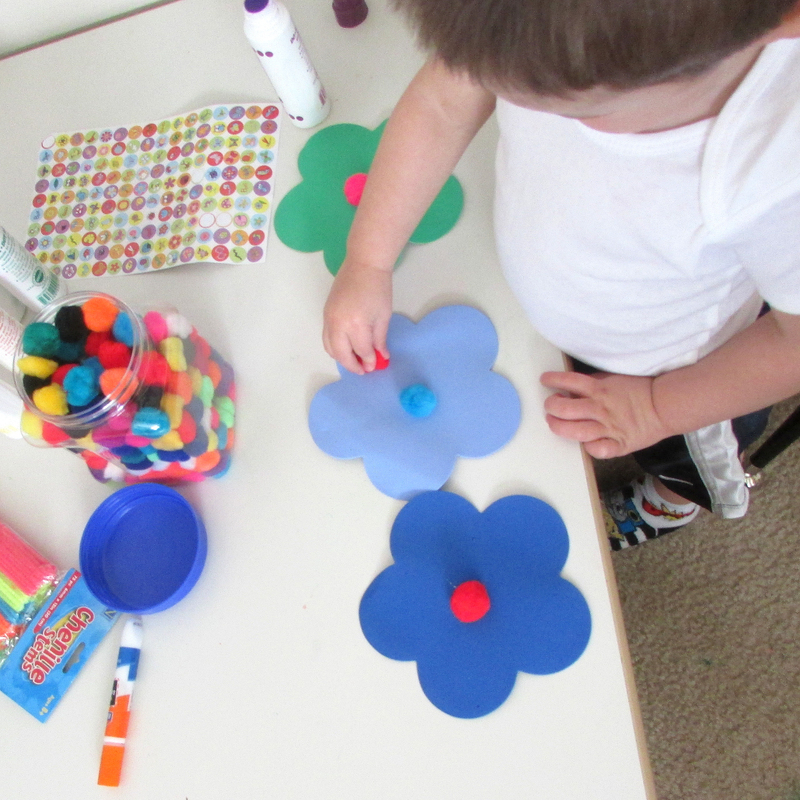 Stamp the petals all around the center circle to make a flower. 5. 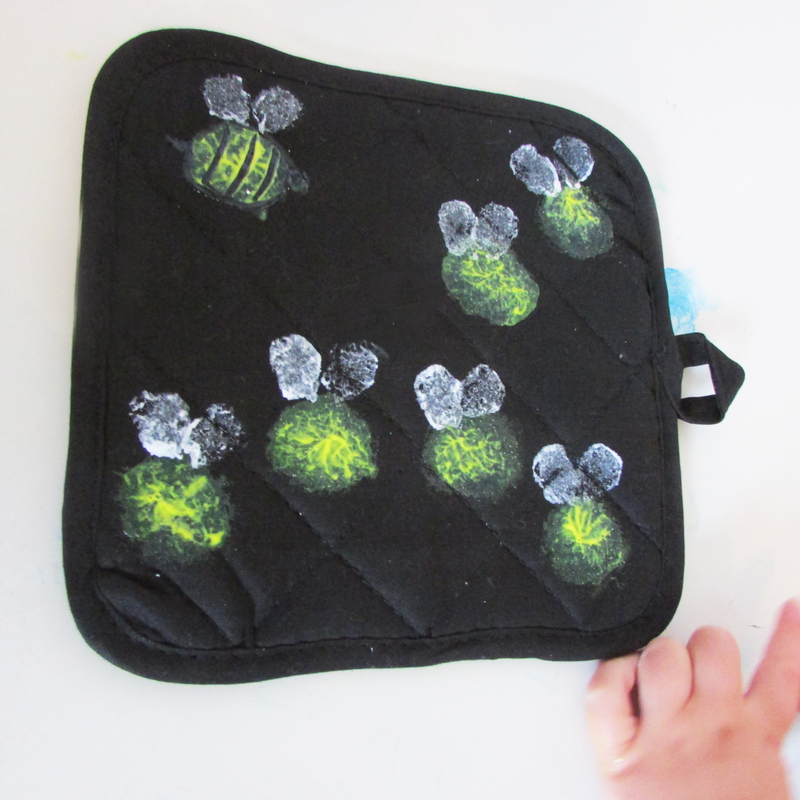 Child: Repeat steps 2 & 3 with yellow paint and a circle sponge stamp to make as many bees as you would like. 8. 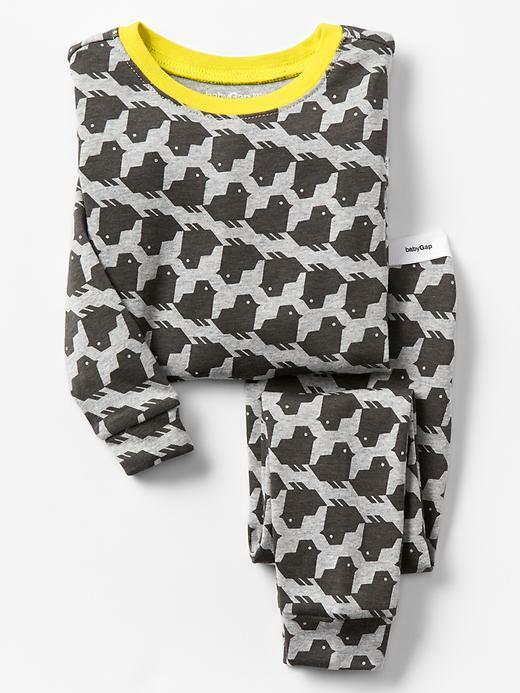 Grown-up: Use the black fabric paint to add stripes, a head, and a stinger to the bees. 9. Grown-up: Use white paint to add the name of the person you are giving the oven mitt to. You can simply write it with the fabric paint squeezed right out of the tube, or see below for the rubber stamp method we used. 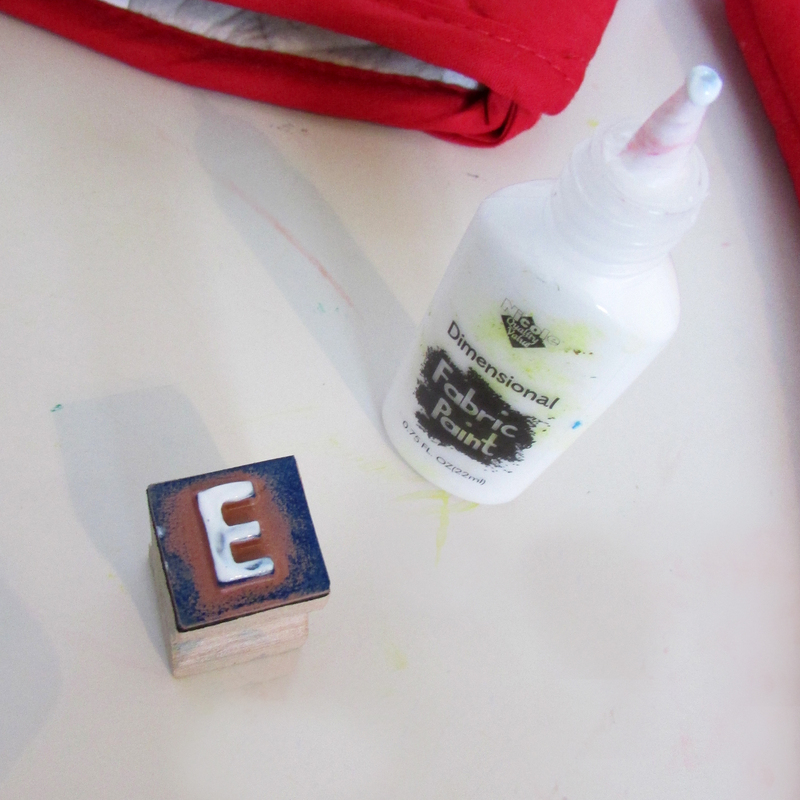 OPTIONAL: To use rubber stamps for the name, carefully apply the fabric paint directly to the rubber letter stamp. Trace the letter with the paint so that it has a nice even layer on it but there is no residue on the sides of the stamp that will transfer when you stamp it. 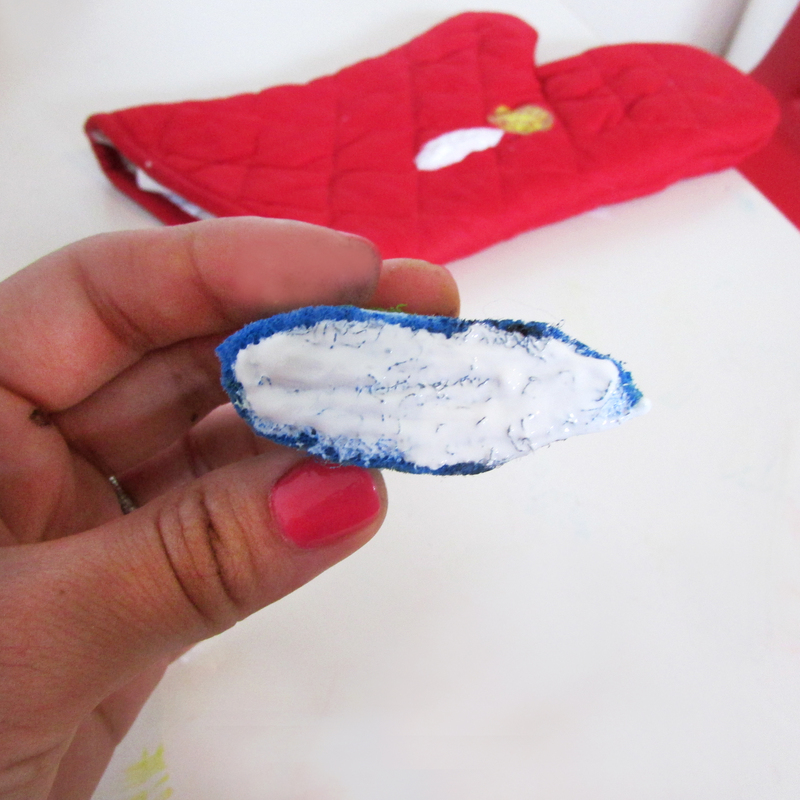 Stamp the letter onto your mitt and then clean the remaining residue from the stamp with a baby wipe. Repeat with all of the letters in the name. 10. 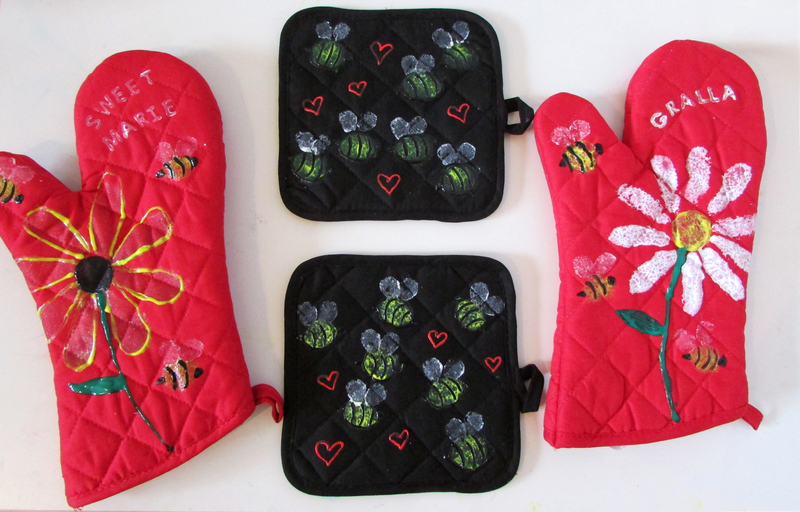 Grown-up & Child: Repeat any of the steps above however you wish to decorate the pot holder. We decorated ours with bees and then painted on little red hearts scattered around. 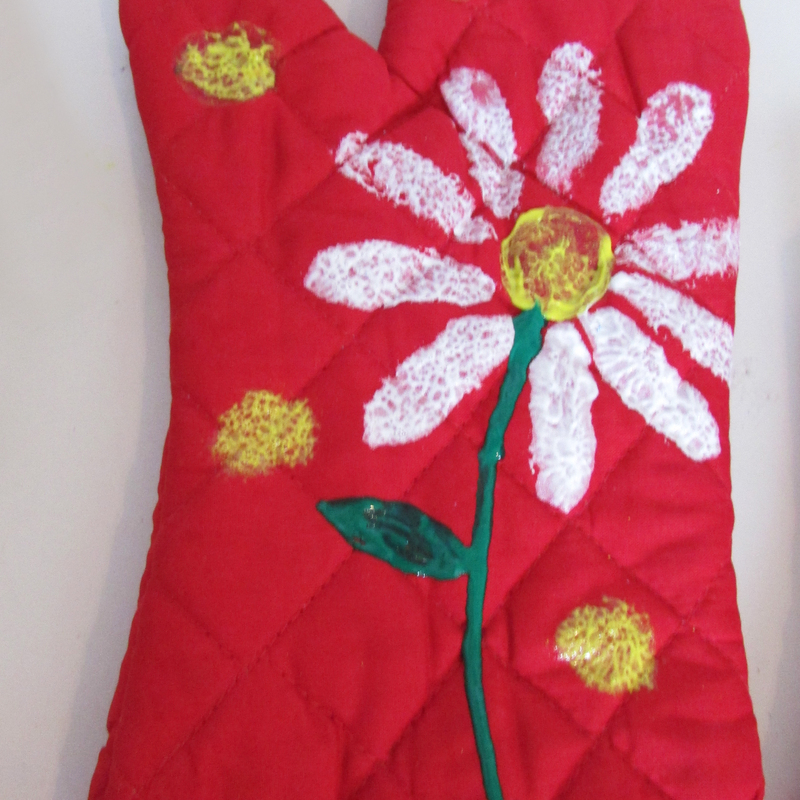 If you get want to do more than one pot holder, it would be fun to do another with a big flower in the center. Have fun and be creative! Do you love to give (or receive) homemade gifts? I know that I sure do! Don’t forget to share pictures of your finished projects with us for a chance to be featured on our Instagram and Facebook pages! To submit a photo on Instagram, tag @makelearngo or send us a direct message. On Facebook, send a message to Make Learn Go. Or e-mail us at makelearngo@gmail.com. For the past 6 months or so, Tommy has had a very annoying habit of digging my wallet out of the diaper bag and pulling everything out of it. 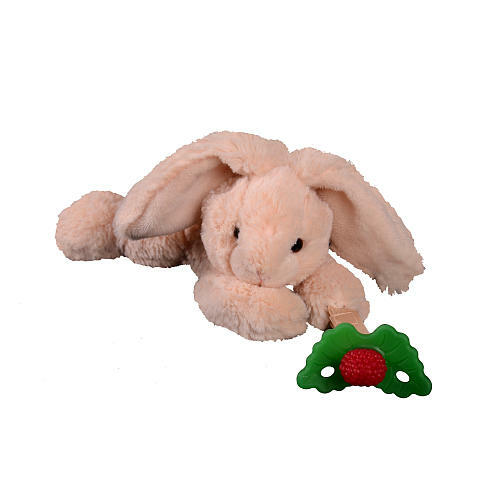 It was driving me crazy when I would get to the store and realize that my credit card or drivers license were missing… and then I would come home to find them strewn across the living room floor with his toys. I recently bought a new wallet that zips all the way around so that it’s harder for him to get into. I was going to throw my old wallet away, but my husband had the brilliant idea of handing the old wallet down to T instead. Since he’s so obsessed with it, why not give it to him? 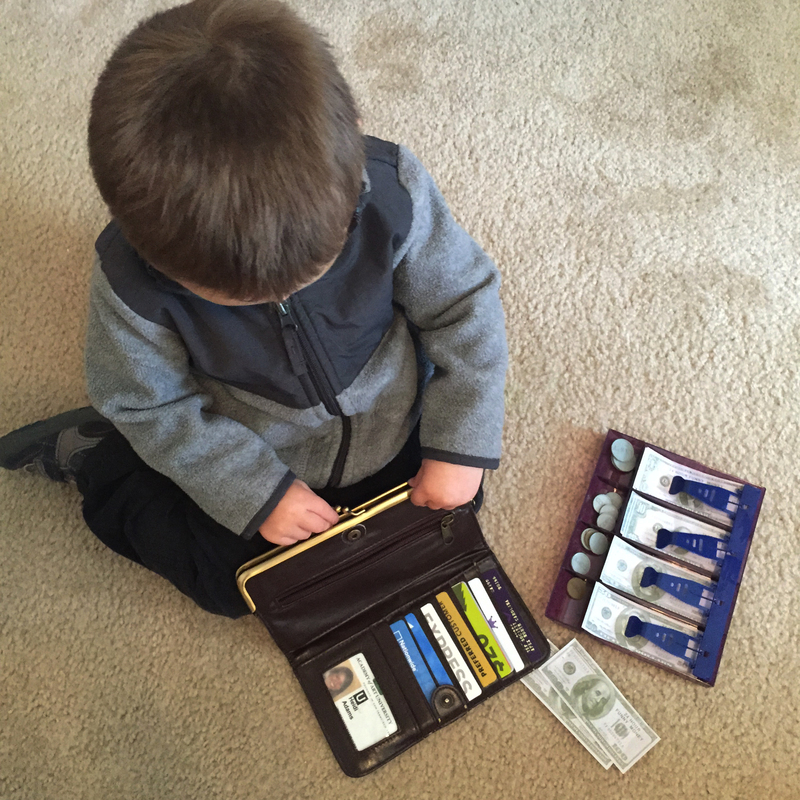 An empty wallet would be no fun to play with, so I gathered some items and now T has his very own play wallet that he can mess with to his heart’s content without being scolded by Mommy! A win for both of us! 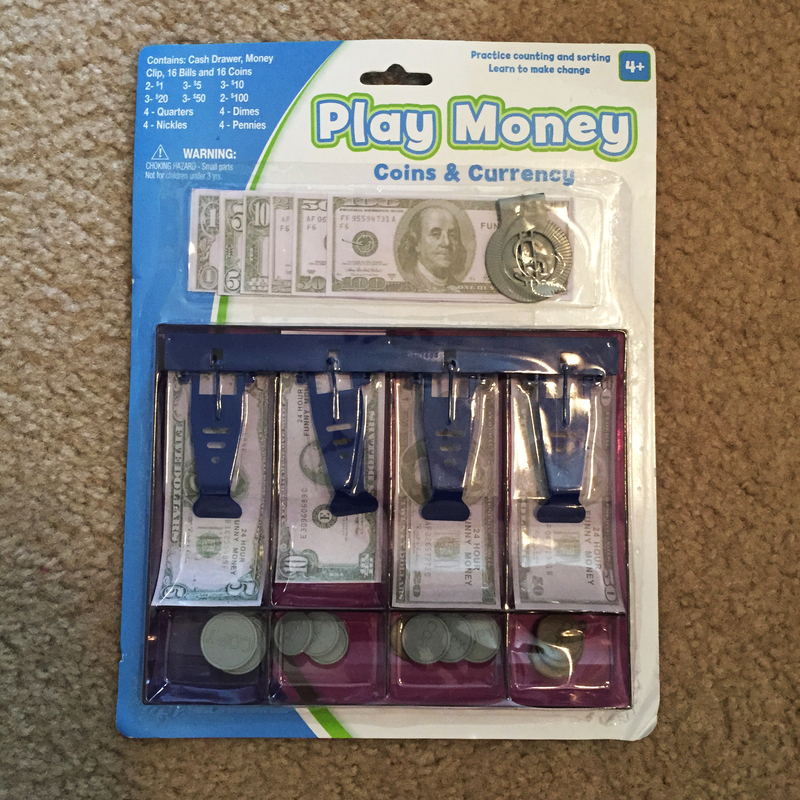 I found this play money at Dollar Tree with bills, coins, and a cash drawer to hold it all- and he loves taking it in and out of the different compartments in the wallet. 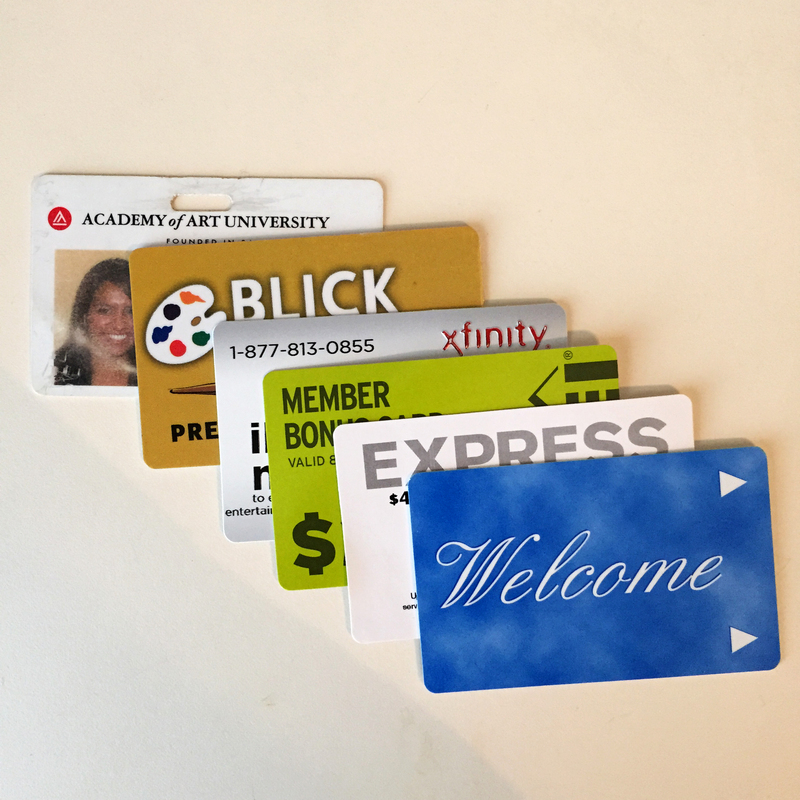 I also gathered some cards for him to put in the wallet, including: an old school ID, preferred customer cards for stores I no longer live near, business cards, an old hotel key, promotional cards from the mail, and used gift cards. 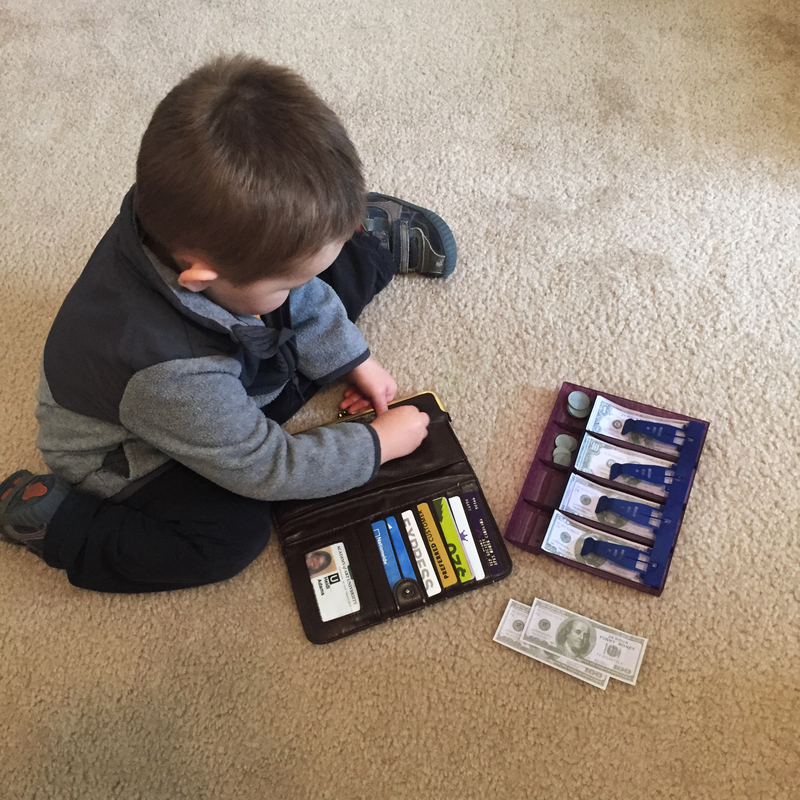 He loves having his own wallet and now he never bothers with mine anymore! Hooray! He also likes to play a game with it where he grabs things from around the play room and “buys” them from me. He uses a little magnet doodle board as a signature pad and it’s adorable. He pretends to swipe the credit card, and then “signs his name” on the doodle board and says “Thank you! 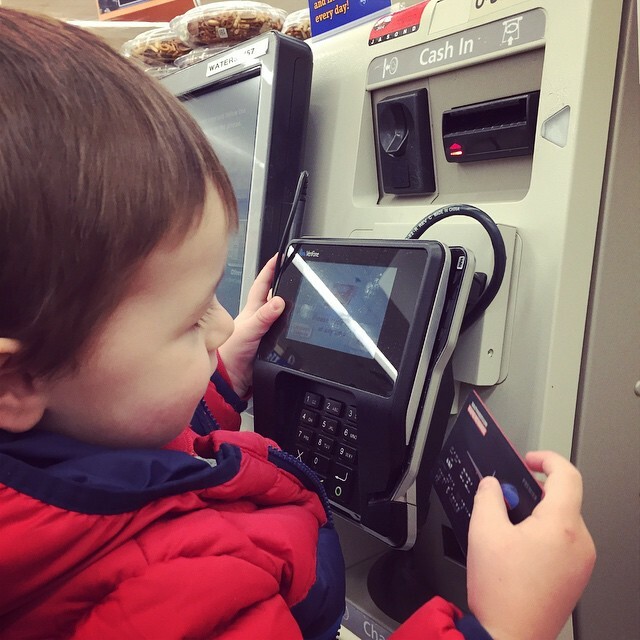 Bye bye!” Then we switch roles and he’s the cashier. I give him the fake money and he sorts it in the cash tray and puts my items in a bag for me. Cutest bag boy ever! Another fun idea for kids who like to play cashier: take them to the grocery store when you only have a few items you need to pick up. 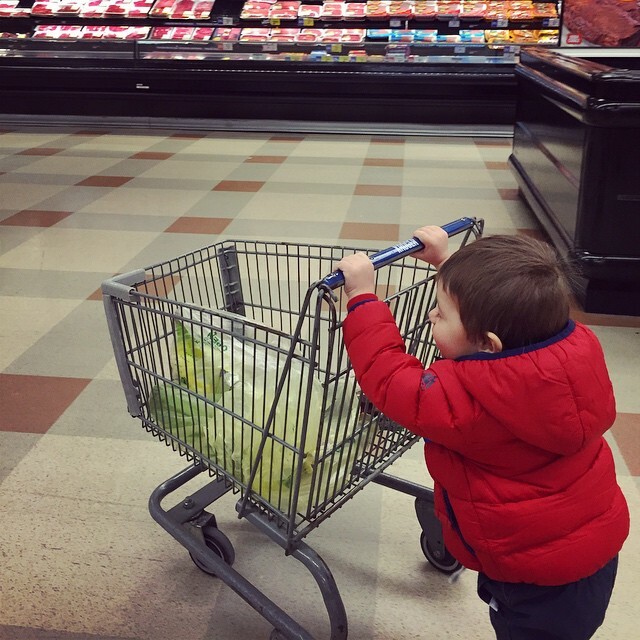 Our local Kroger and Trader Joe’s have mini shopping carts for kids, and T gets so excited when he gets to be in charge of pushing the cart! Also, if your grocery store has a self check-out, it’s really fun for kids to help scan and bag the items if you’re only picking up a few things. Our latest spring craft was a quick little project that was made up of a few materials from Dollar Tree. 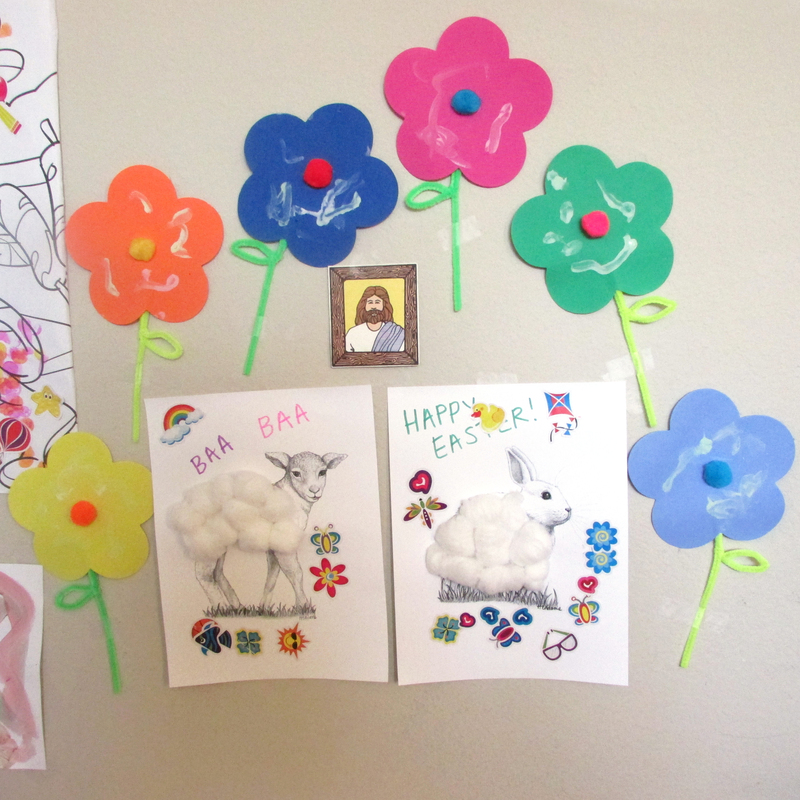 We found some pipe cleaners, colorful foam sheets shaped like flowers, and re-used the pop poms from our Easter Egg Color Sorting activity to make some festive Spring flowers to decorate the playroom! 1. Grown-up: If you need to cut the flowers out of your crafters foam, do that first. 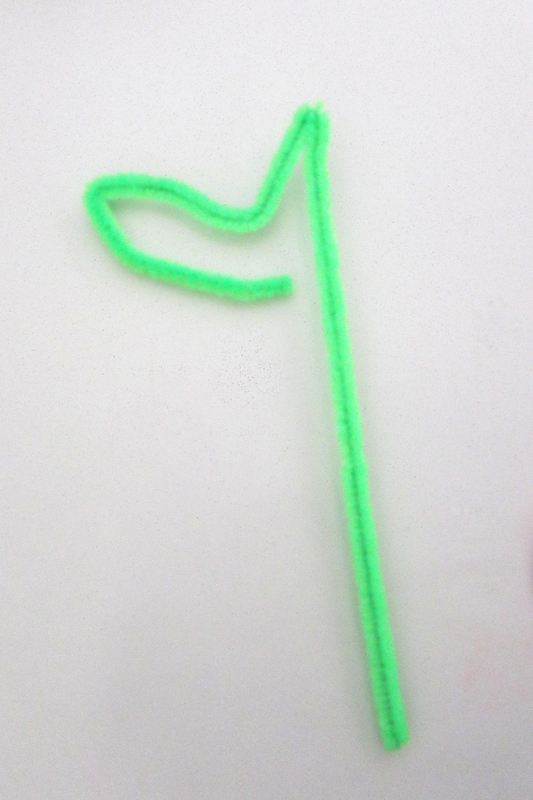 Then, prepare your pipe cleaner flower stems. 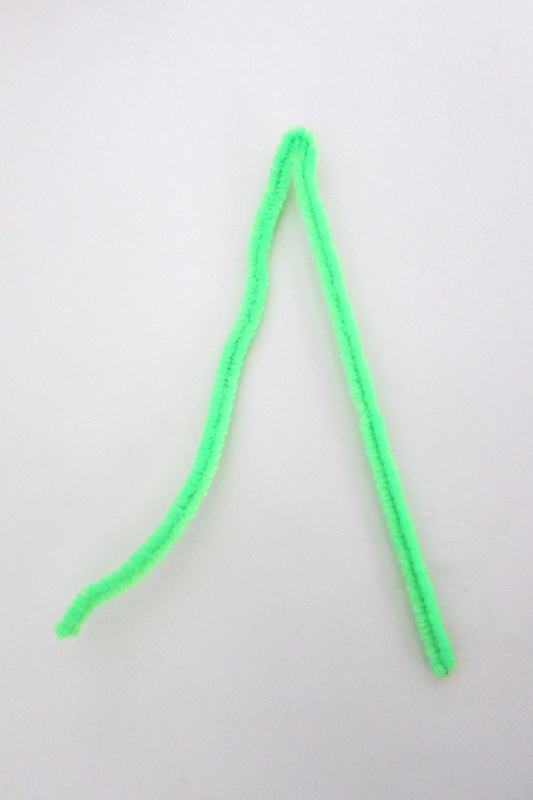 Fold a pipe cleaner in half, then bend one side of the “v” shape to make a leaf (as pictured below). 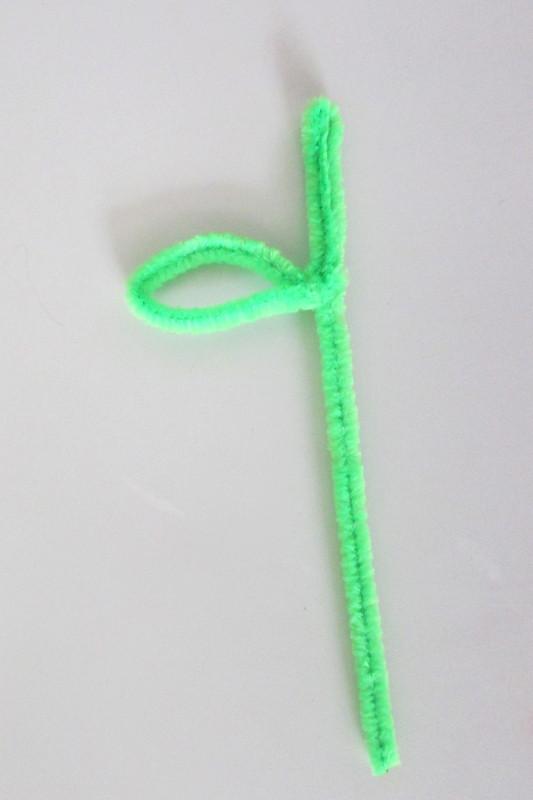 Pinch the pipe cleaner together at the stem and then wrap the end of the leaf around the stem to hold the leaf shape. Make one stem for each flower you plan to make. 2. 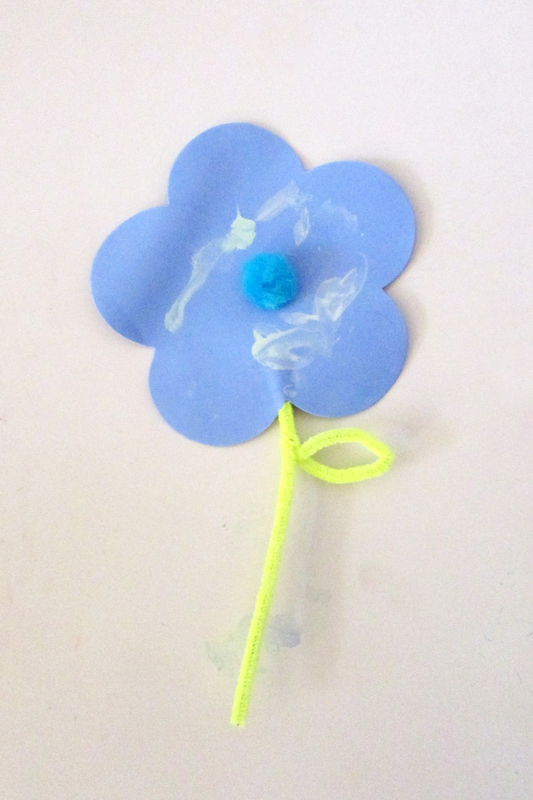 Grown-up & Child: Squeeze a dot of glue in the middle of each flower. 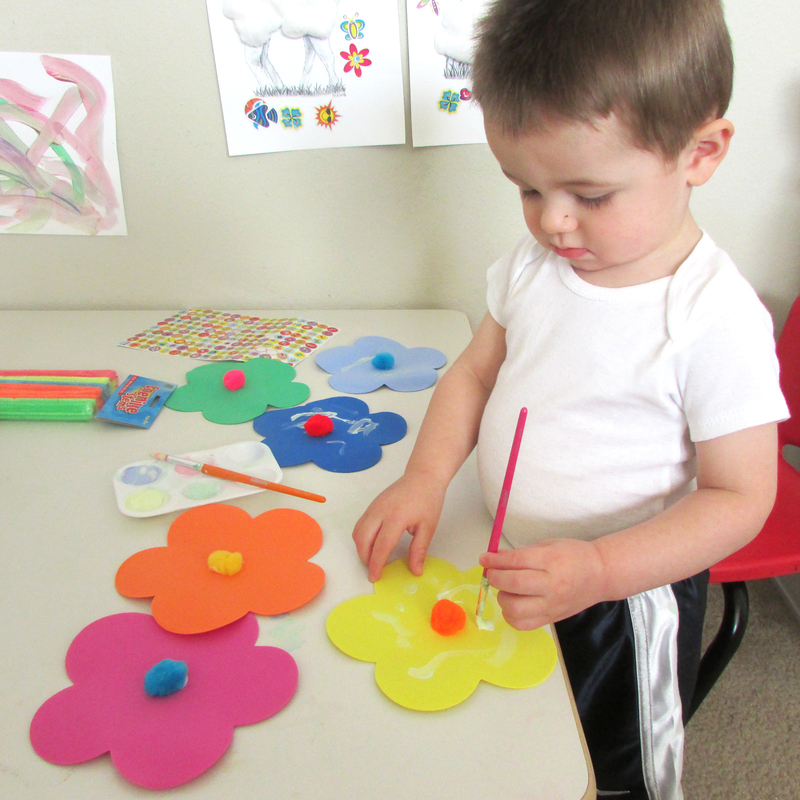 Let your little artist choose a color of pom pom to go in the center of each flower and place it on the glue dot. 3. 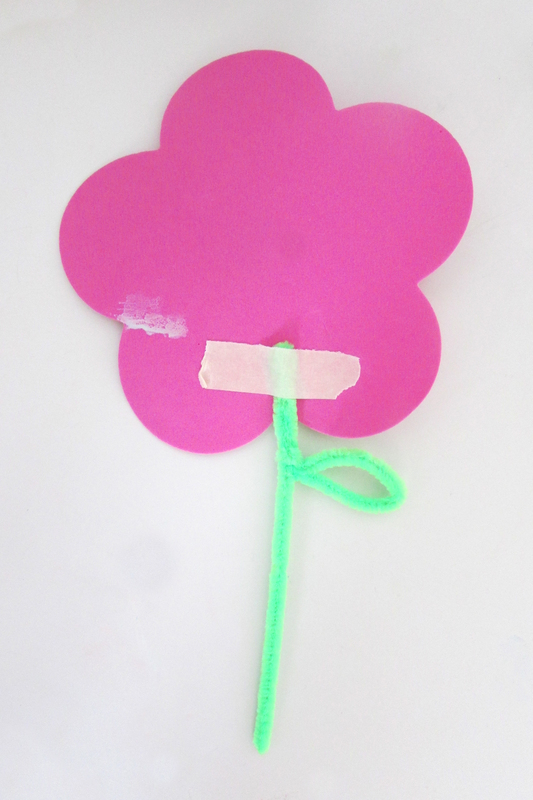 Grown-up & Child: Turn the flowers over and help your little one secure the stems in place with tape. 4. Child: Turn the flowers over and decorate! T used pastel colored tempera paint to add some swirly strokes and texture to his flowers. Go ahead and make your own flowers, and comment below to let us know how it goes! Or better yet, upload a picture to Instagram and tag @makelearngo, send a message to Make Learn Go on Facebook, or e-mail your photo to makelearngo@gmail.com for a chance for your child’s artwork to be featured on our Instagram and Facebook pages! 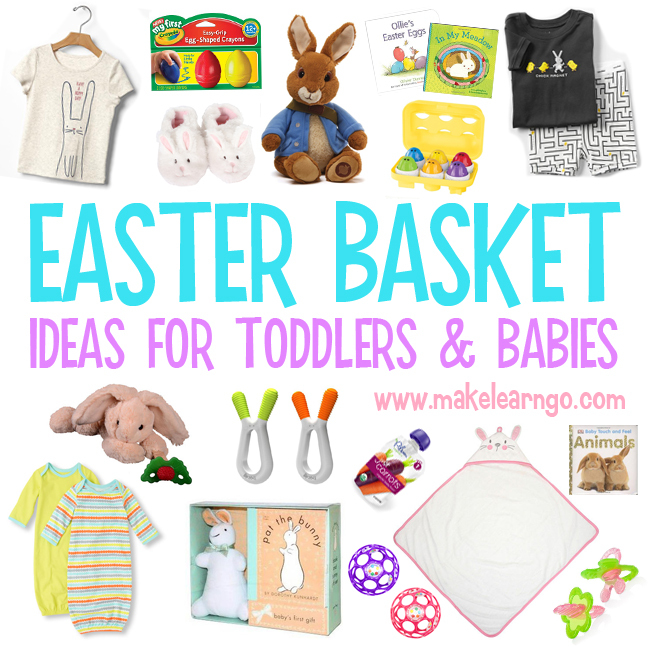 And if you’re still trying to figure out what the Easter Bunny is going to bring this year, here’s our helpful list of Easter Basket Ideas for Toddlers & Babies. Play dough is something we play with a lot. We love it because there are endless possibilities to the things you can create and different ways you can play with it. 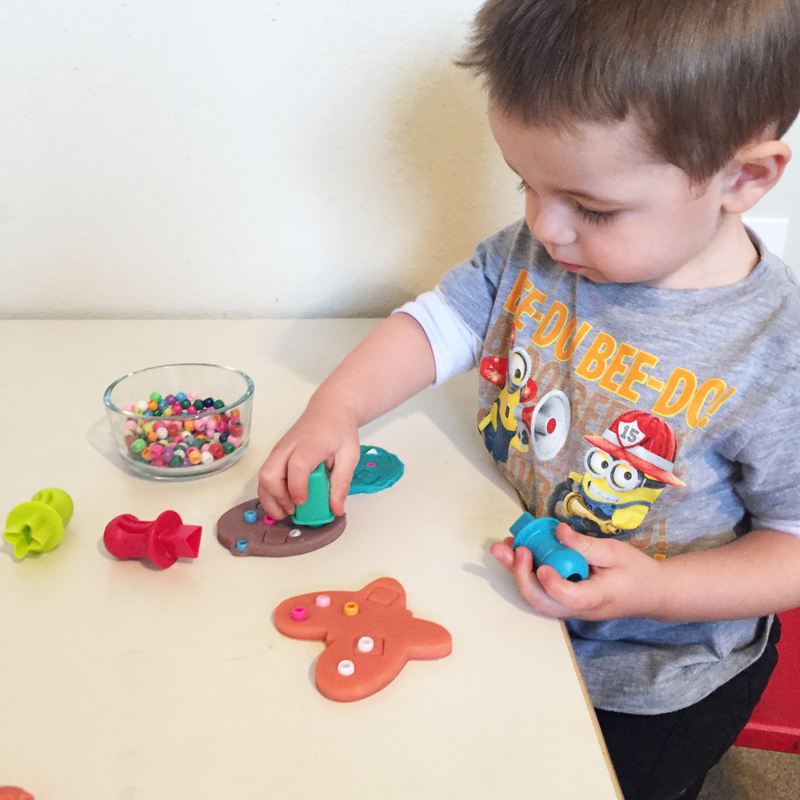 My little Tommy really likes to roll out his play dough and use cookie cutters to make different shapes. So when I saw some fun Easter-themed cookie cutters out at our local Kroger, I made sure to grab a couple! I picked out an egg shaped cookie cutter and let T choose one. He chose a butterfly. 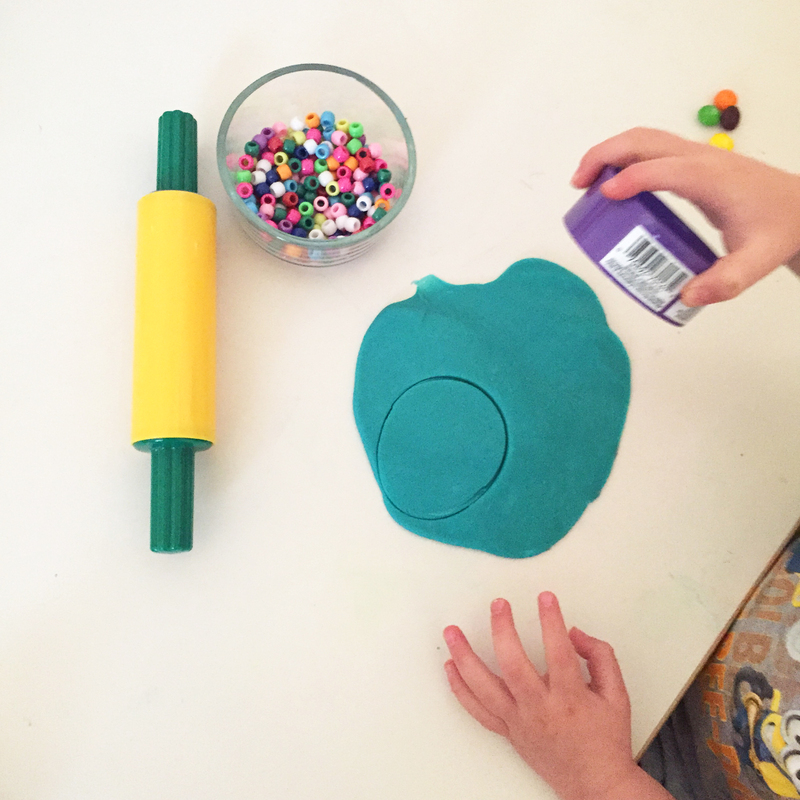 When we got home, we picked out some some bright colors from our play dough stash and got to work rolling and cutting out our fun Easter shapes. We used some brightly colored pony beads (left over from our Easter Egg Color Sorting activity) to decorate the eggs and butterflies. 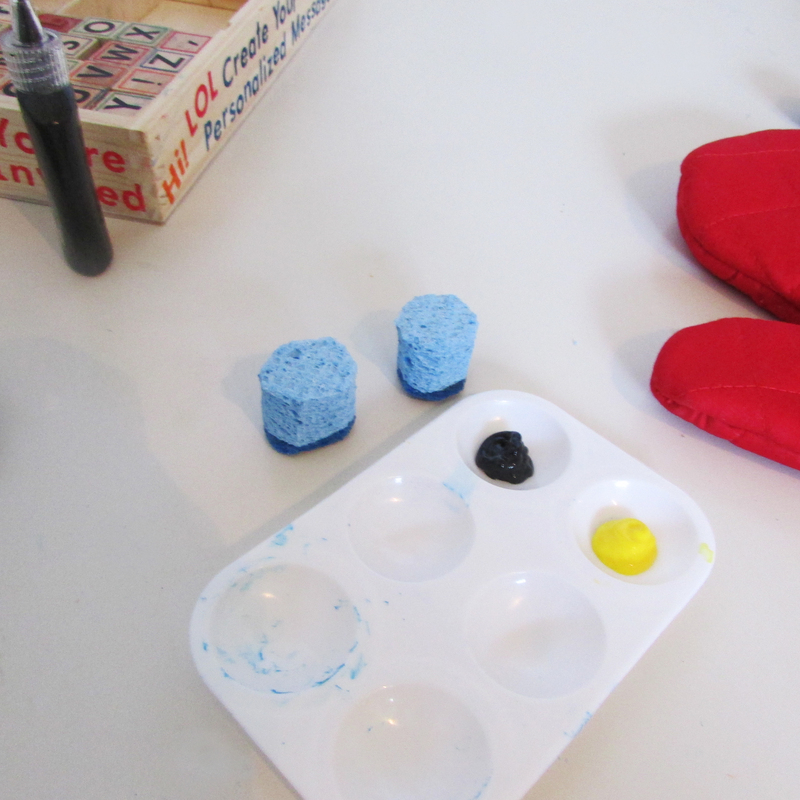 He also liked using these little Crayola Model Magic Press N’ Pop Texture Tools to stamp shapes into the play dough. 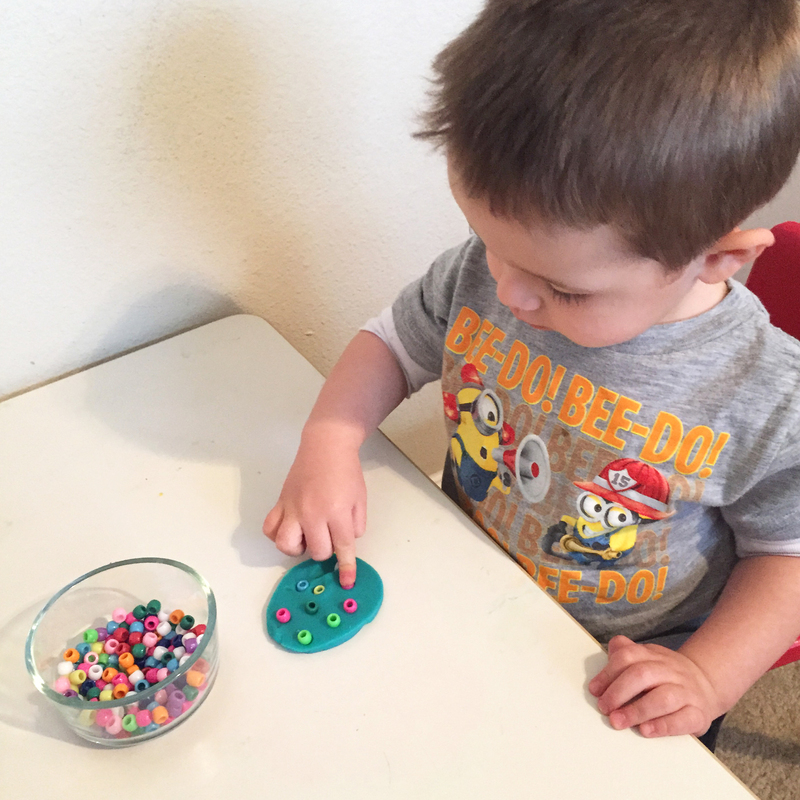 It was such a simple activity, but and it kept the little guy entertained for a long time! 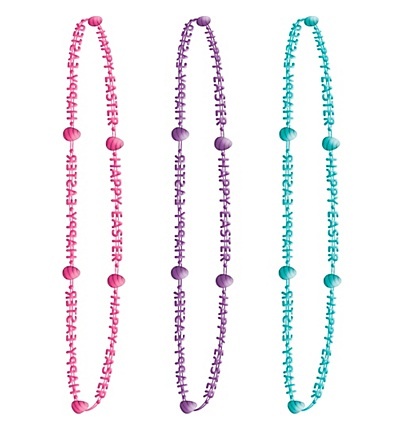 He had lots of fun choosing which beads to use to decorate, and it was another opportunity to work on learning colors. 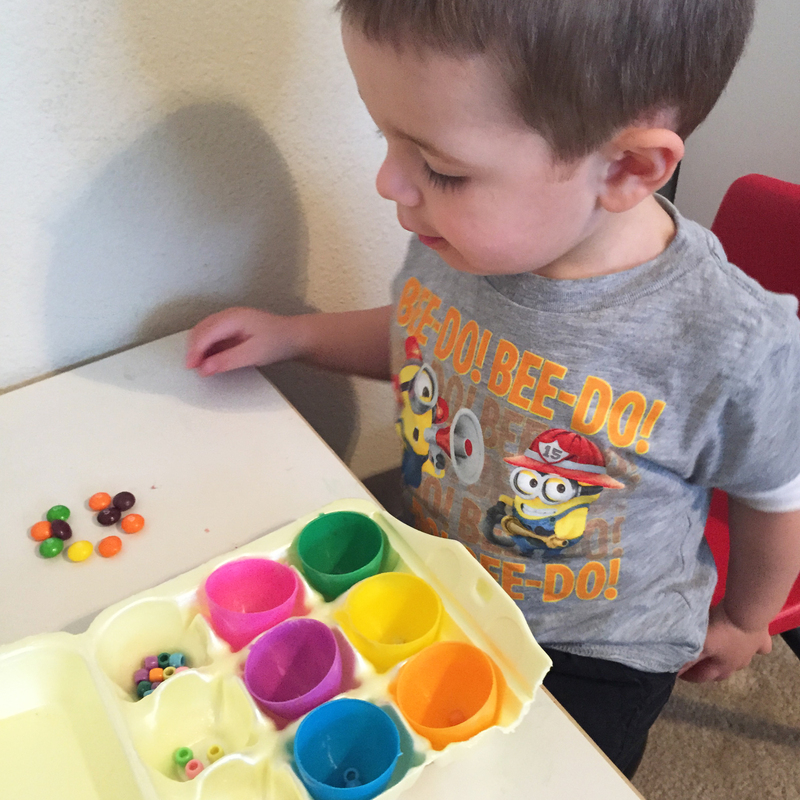 Picking up and placing the little beads was a great activity to sharpen his fine motor skills, and trying to pick the beads out of the dough afterwards stepped it up to a bigger fine motor challenge. Next time we try this, I want to add pipe cleaners to make antennae for the butterflies. I also saw a cute cookie cutter shaped like a bunny’s head that could be fun, too- maybe with googly eyes, pipe cleaners or toothpicks for whiskers, and a bead or button for a nose). 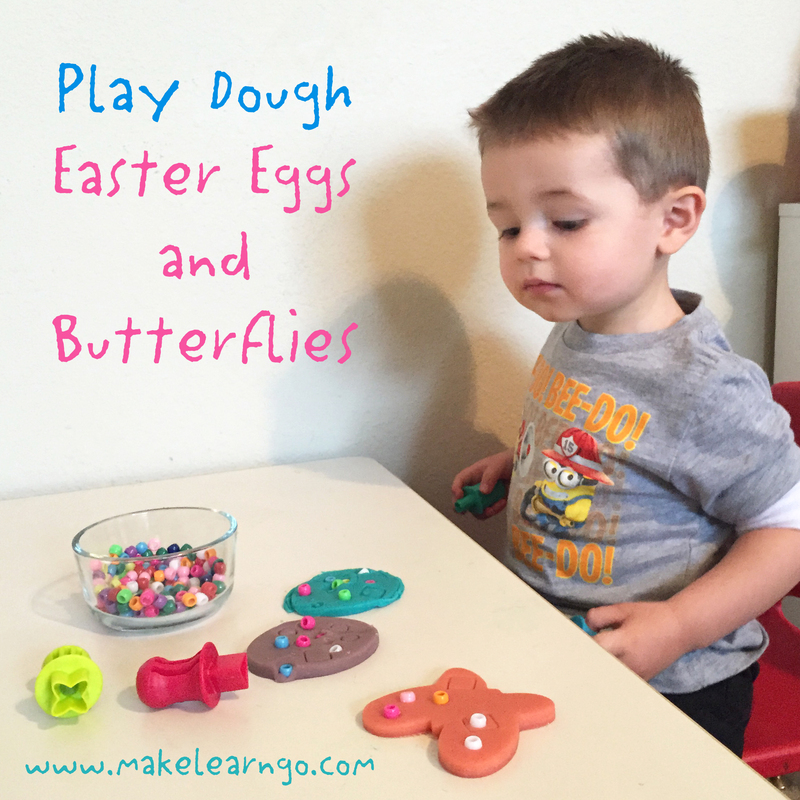 Try it out, and let us know how you decorate your Easter play dough creations! Take a minute to check out my simple solution for How to Fix Dried Play Dough.With a few minutes and one magic ingredient from your kitchen, play dough that was accidentally left out overnight will be as good as new! Dollar Tree is one of my very favorite places to shop lately. The place is loaded with inexpensive supplies for all sorts of fun projects and activities, and the best part is that EVERYTHING is $1! I can let T choose whatever random toy or book he wants and I don’t have to worry if it will break or if he will get tired of it in a week, because it only cost a buck! The other day when I entered the store and saw all of the colorful plastic Easter eggs in front, a fun activity for T instantly came to mind. Recently, we have started working on learning colors. 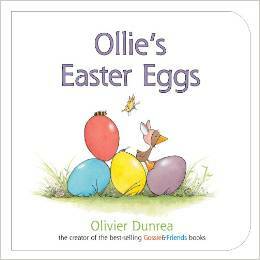 What better seasonal objects to use for a color activity than Easter eggs? At 21 months old, he’s not quite getting the hang of recalling all of the color names, but we are working on color matching to start. So I browsed through the aisles in search of single-colored objects that would fit inside of the plastic Easter eggs and matched the colors of the eggs. 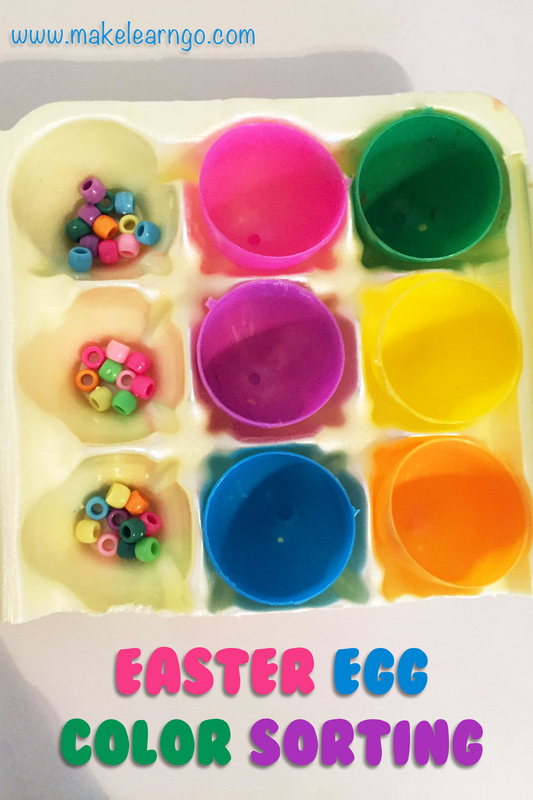 For $4, we got all of the supplies needed for our color sorting activity: a package of 18 plastic Easter eggs, a bag of colorful pom poms, a bag of colorful pony beads, and a box of Skittles candies! 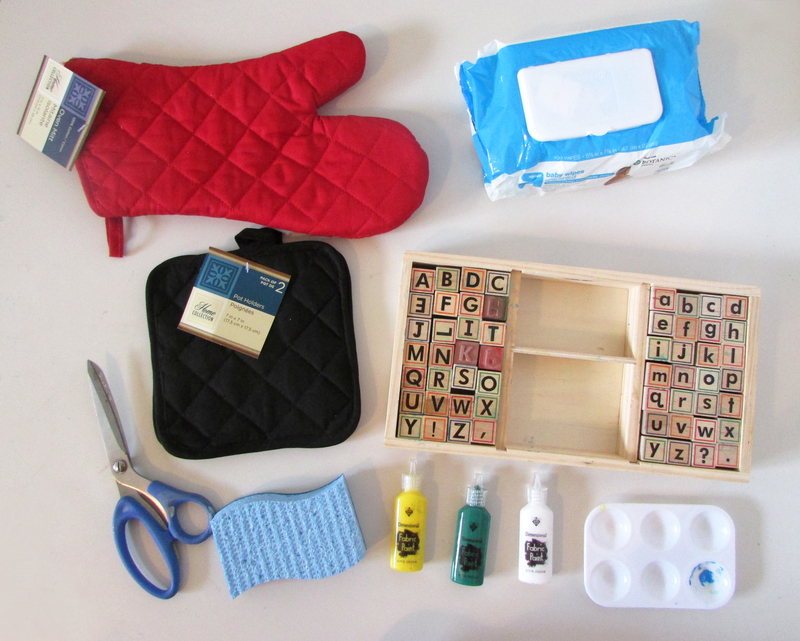 T had lots of fun doing this activity, and an added bonus is that all of the items can be re-used for other projects and activities later on! Score! 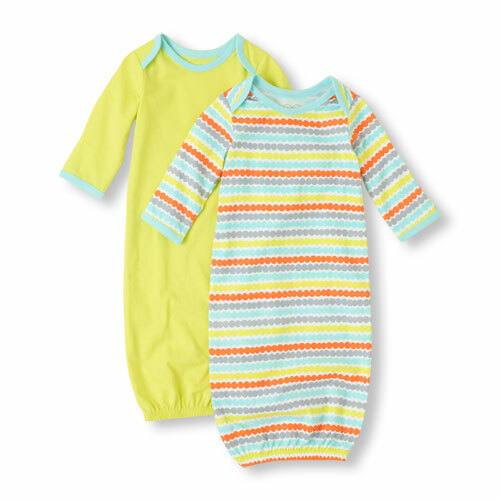 Child: Let your child move the objects one at a time to the egg of the coordinating color. Repeat steps 3 & 4 with the various items you have gathered. 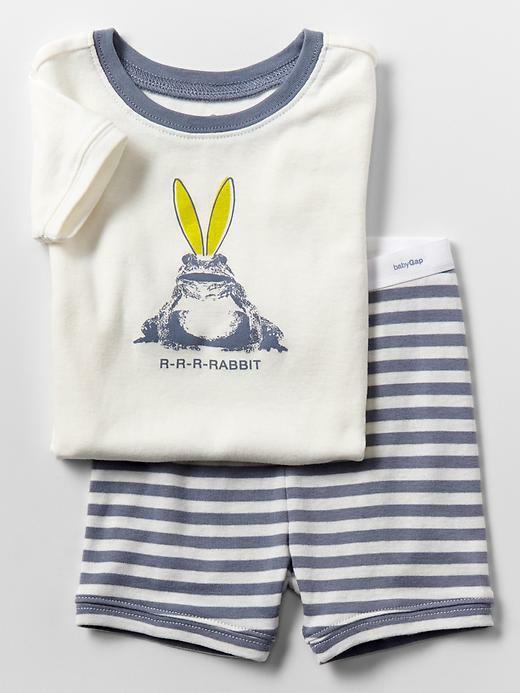 Try it out with your little one, and let us know how it goes! 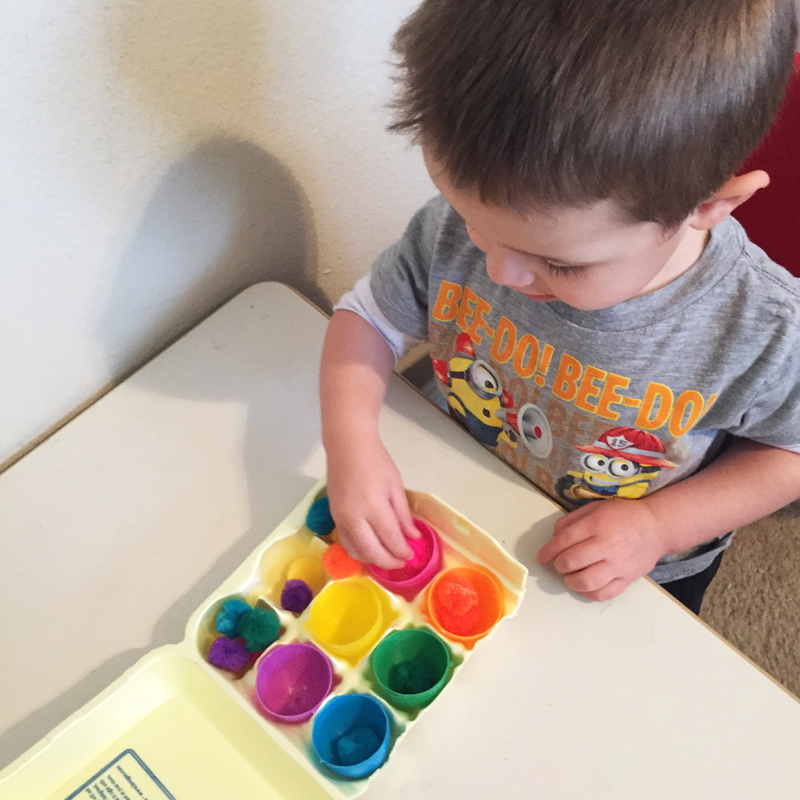 What other items did you add to your color sorting egg carton? Share with us in the comments below or tag @makelearngo on Instagram! 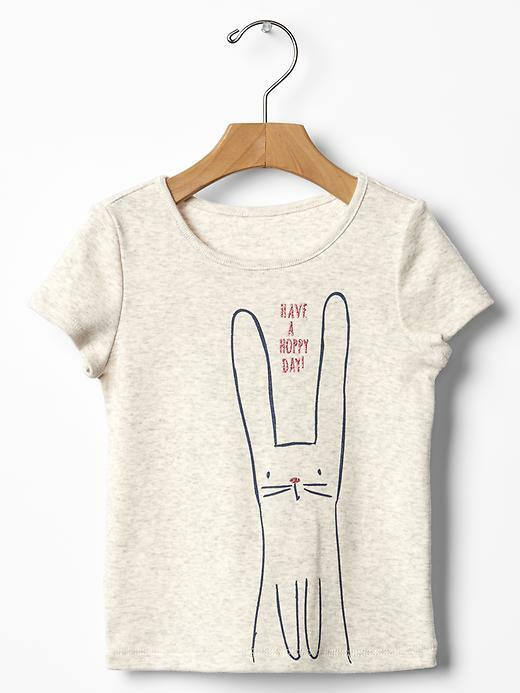 For those of you who didn’t know, I am a mama by day and a freelance illustrator by night (and nap time!). The other night as I was finishing up a project to send over to a client, I came across this little lamb sketch that I did a few years ago. 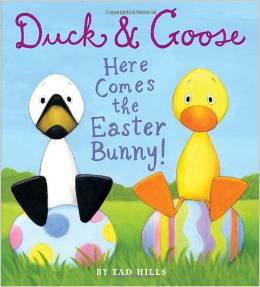 With springtime and Easter on my mind, I instantly thought up an adorable craft that my little Tommy could make using this drawing as a base. 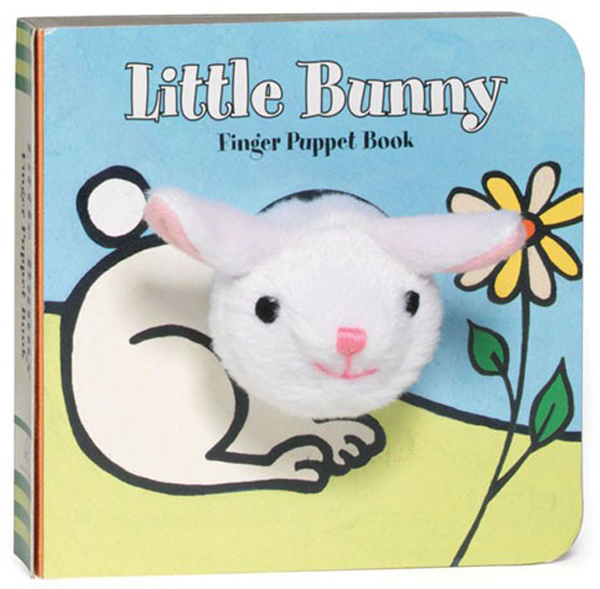 Of course, no Easter craft involving fluffy white baby animals would be complete without a bunny, so I whipped up a little bunny drawing to go along with it! 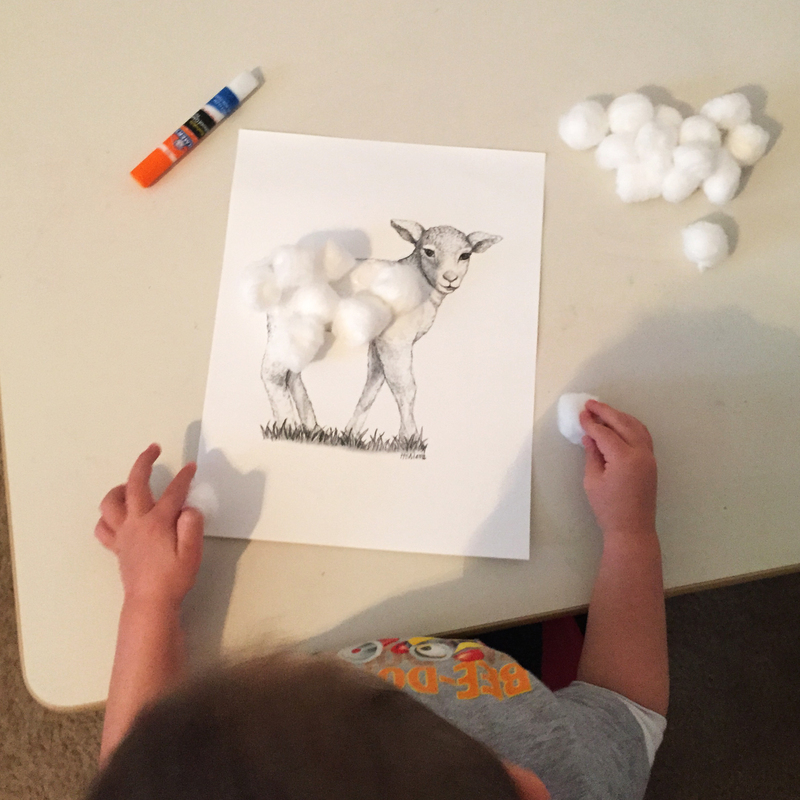 Grown-up & Child: Squiggle some glue onto the body of the little lamb and let your little one help place cotton ball “wool” all over to make the lamb cute and fluffy. 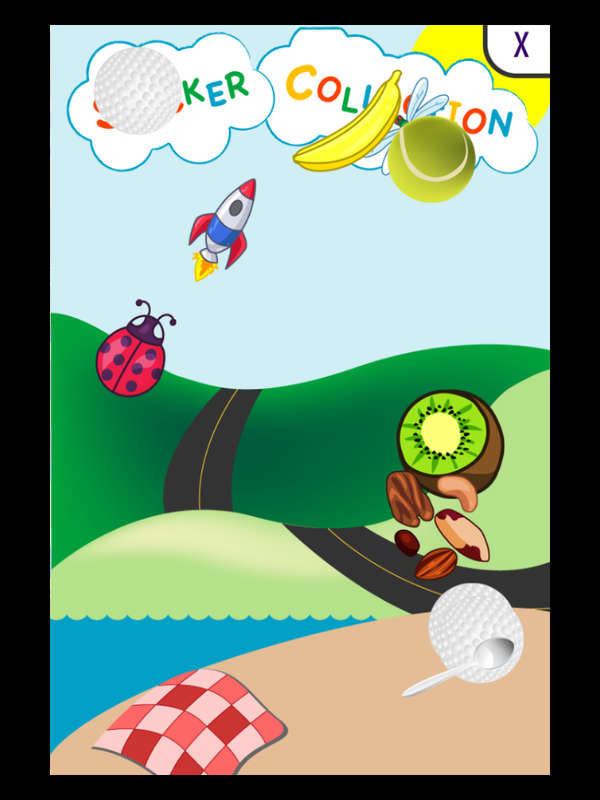 Child: Decorate your picture with colorful stickers, color the background, and add words or designs to make it your own. 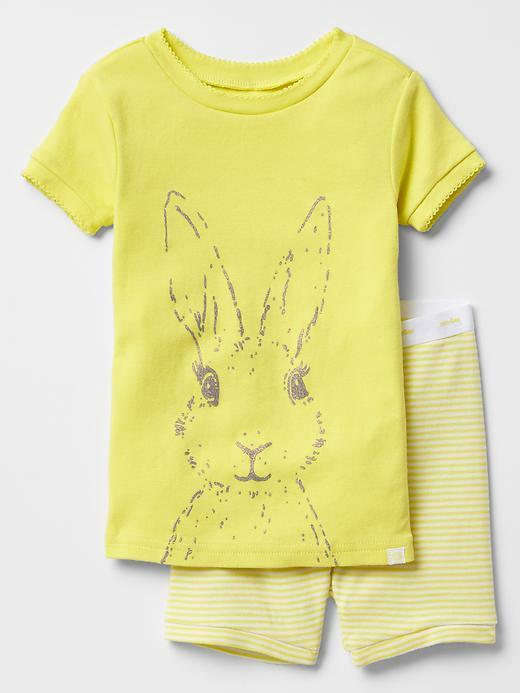 Repeat steps 2-3 with the Little Bunny printout. These printouts are free for personal use, but please remember that I am the artist and I retain the copyrights to the artwork. These art files (along with any other art or photography that I post on makelearngo.com) cannot be copied, reproduced, or sold without my permission. If you have any questions about this, please e-mail me at makelearngo@gmail.com. Thank you! When you make this with your little artist, don’t forget to take a picture! 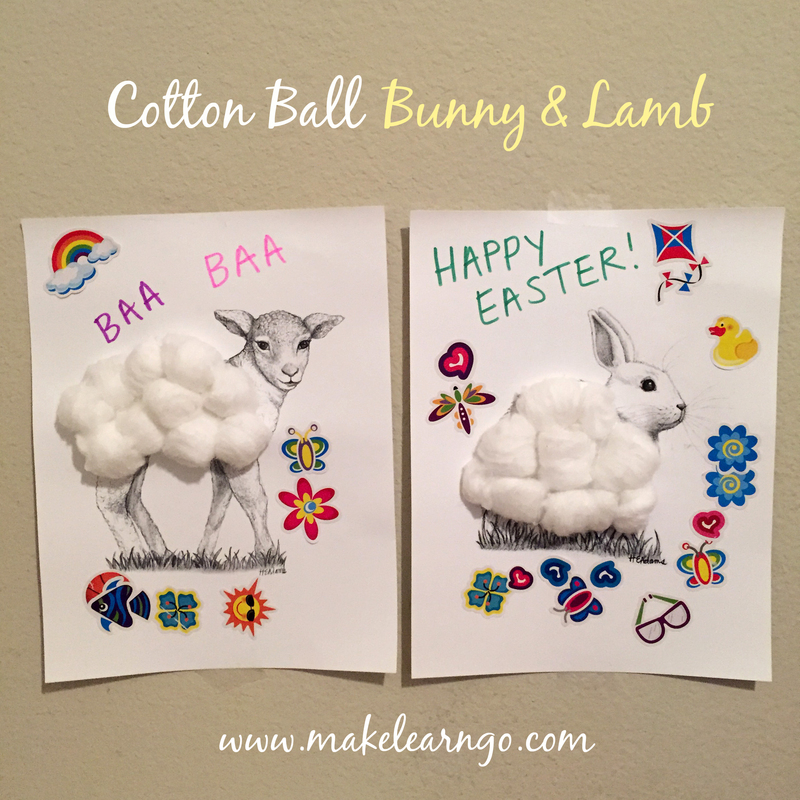 Tag @makelearngo on Instagram, send a message to Make Learn Go on Facebook, or e-mail your photo to makelearngo@gmail.com for a chance for your child’s artwork to be featured on our Instagram and Facebook pages! I featured this project on Instagram (@makelearngo) and Facebook (Make Learn Go) last week, but never got around to posting about it here on the blog. 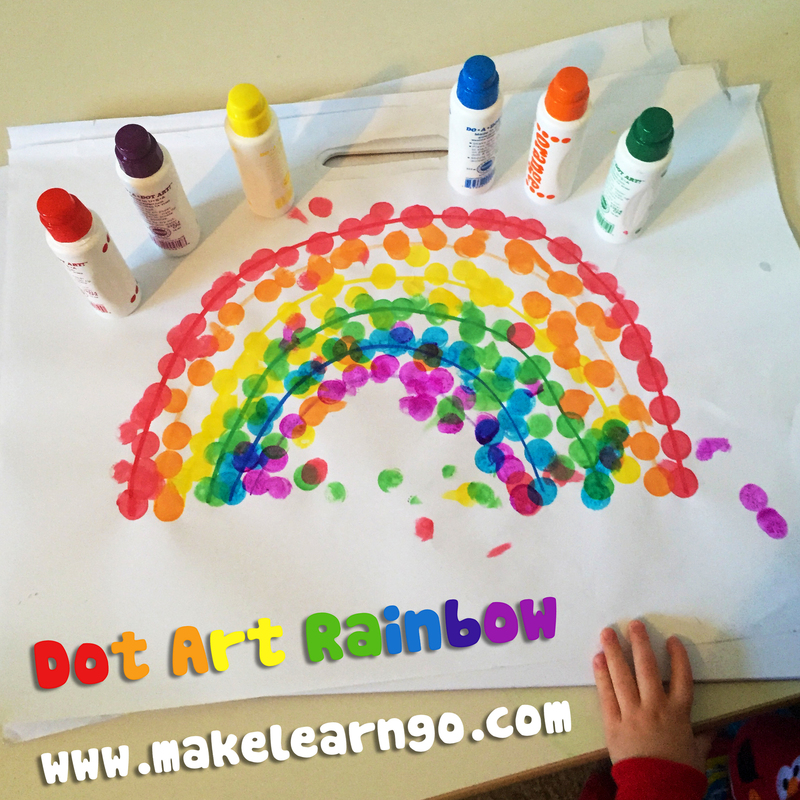 We did this project while learning about rainbows before St. Patrick’s Day, but this is a great project to do any time of the year! 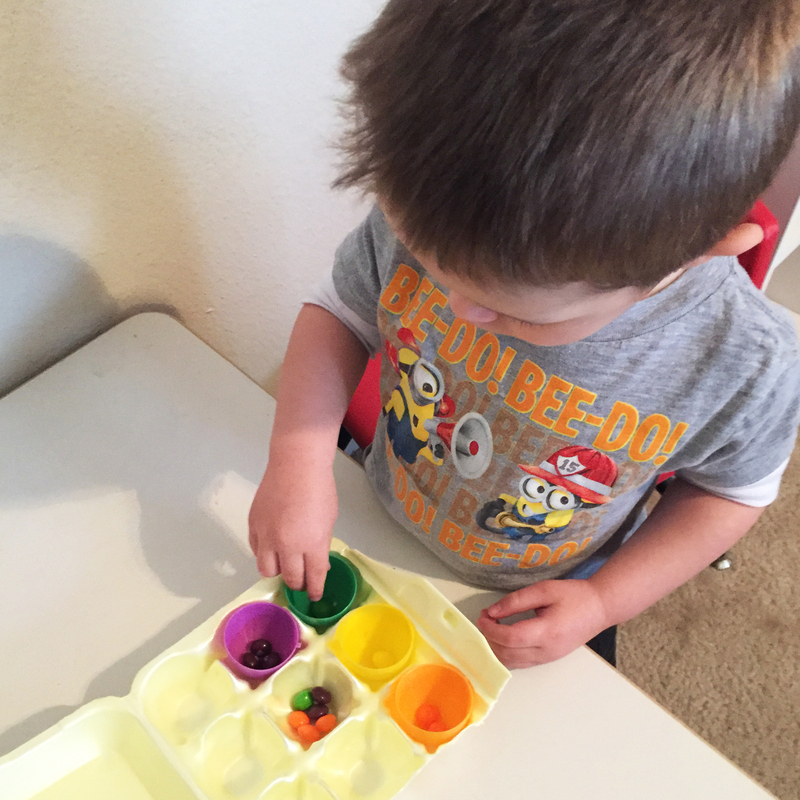 It’s a fun way for your child to work on color recognition and color matching as well as hand-eye coordination. Grown-up: Draw a thin arc in each color of the rainbow to make the template for your child to stamp over. 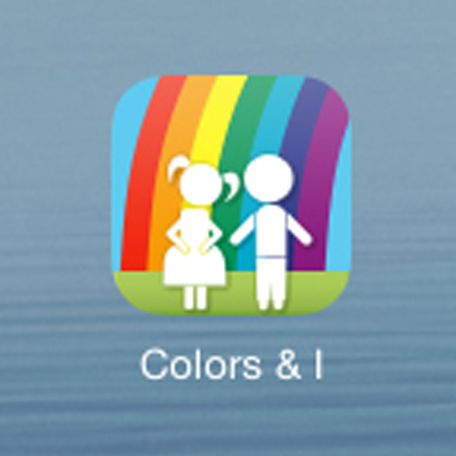 Child: Choose the correct color of dot marker to match the first arc of the rainbow. Child: Stamp over the arc with the coordinating color of dot marker, trying to keep the dots following along the line as closely as possible. Continue until the entire arc is covered in dots. 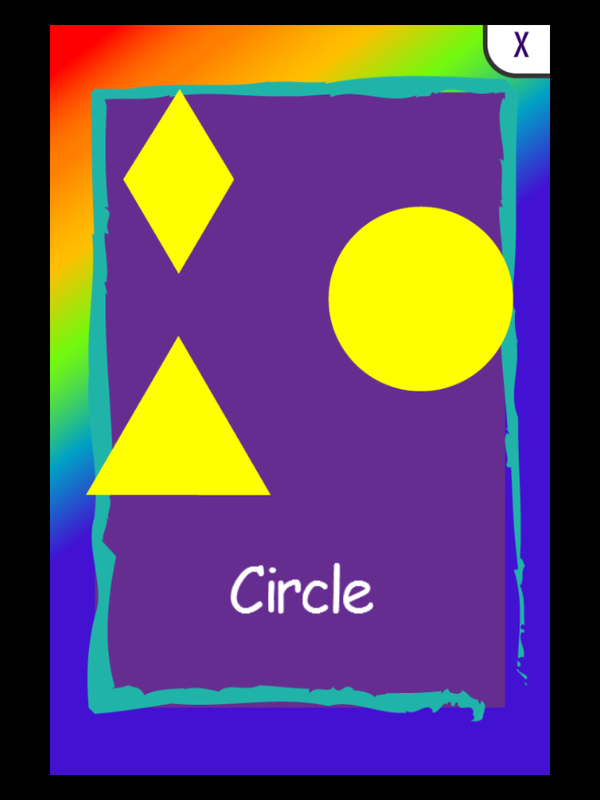 Child: Continue steps 3 & 4 with each arc until your rainbow is complete! So easy, fun, and educational! 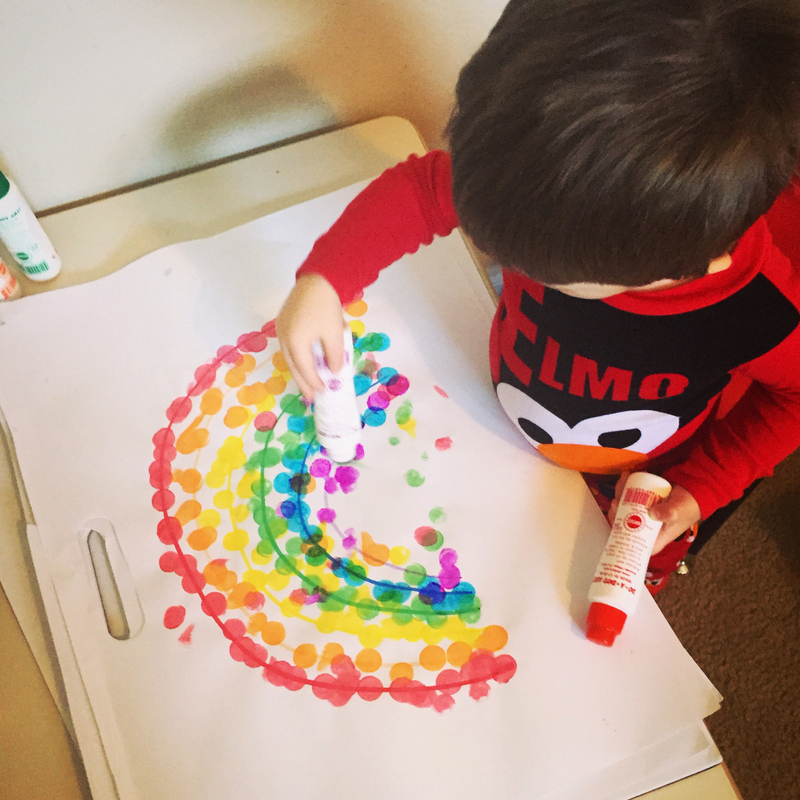 Go get to work with your little artist, and share a picture with us for a chance to be featured on our Instagram and Facebook pages! 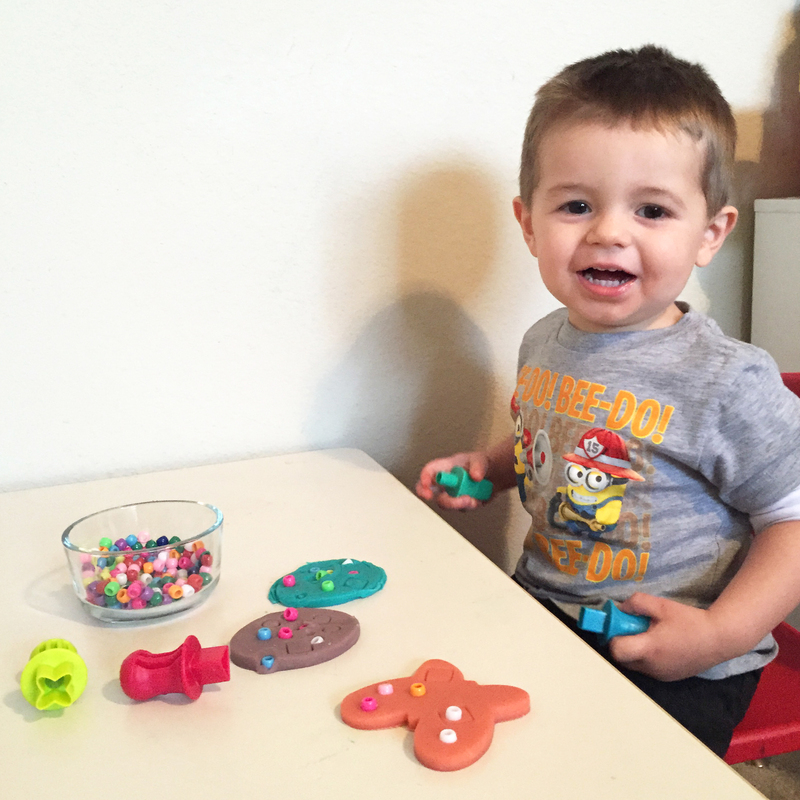 My little guy loves play dough! 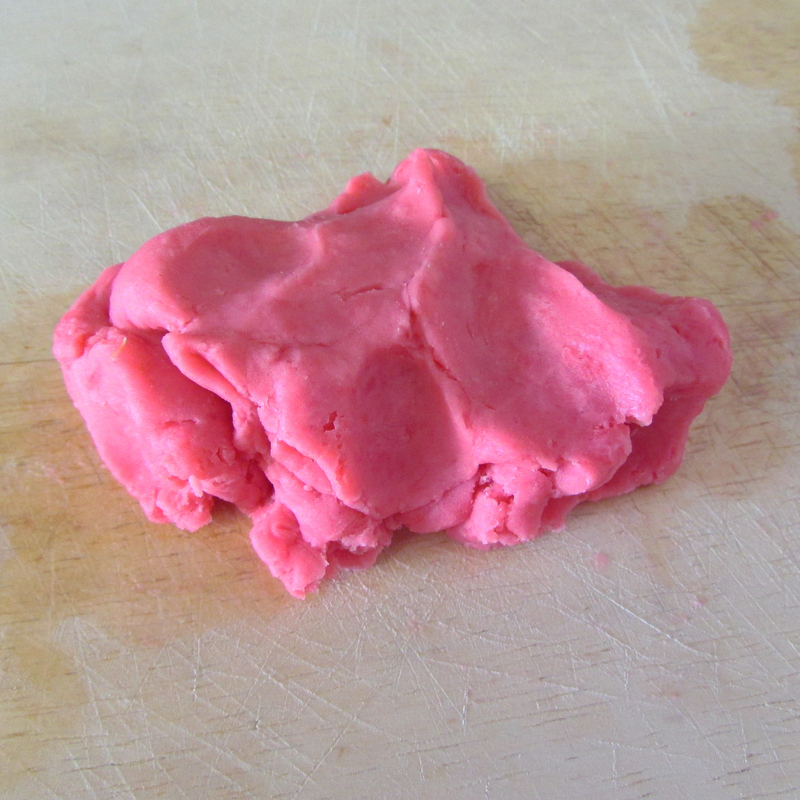 We have been using this awesome homemade play dough recipe (#1 on the list from We Love Being Moms). It’s so easy to make and has a great texture like the store-bought kind that is not too crumbly or sticky. 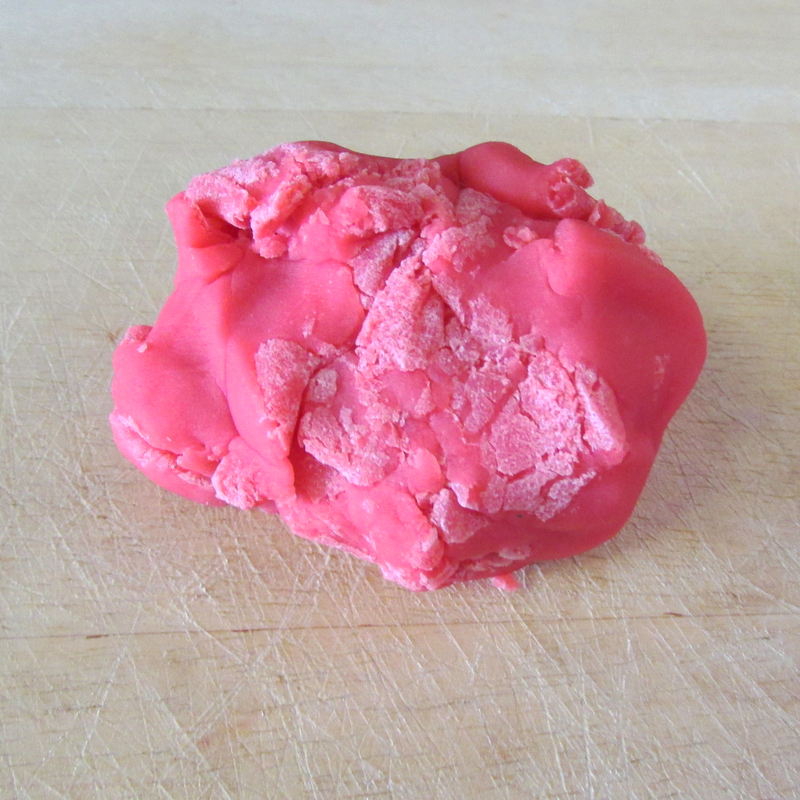 But T now knows how to open up the play dough by himself, and of course he doesn’t always remember to put it away when he’s done… this morning I found a bunch of play dough that he had rolled out to use with cookie cutters and left sitting out overnight. It had dried out a lot and was really crumbly with hardened bits all over the top. 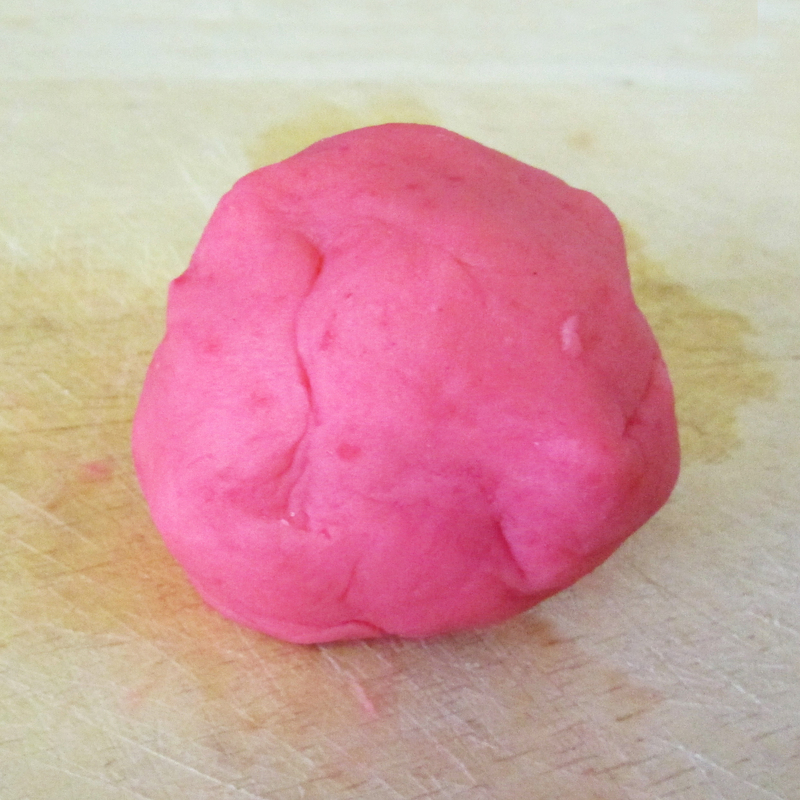 But, with just one magic ingredient plus water, and 3 simple steps, our dried-out play dough was as good as new! The magic ingredient? Cream of tartar! There were two different colors of play dough that were left out- I did one with the cream of tartar and one with only water. The one that I tried to revive with water only was so gooey and slimy afterwards that I had to toss it, but the one with the cream of tartar mixed in was perfect! You really would never know that it had ever dried out! 1. Roll the dried play dough into a ball and knead it in your hands for a minute to break up the dried layer on top and soften it up a bit. 2. In a bowl, mix together 1/8 teaspoon cream of tartar with 1 tablespoon water. 3. 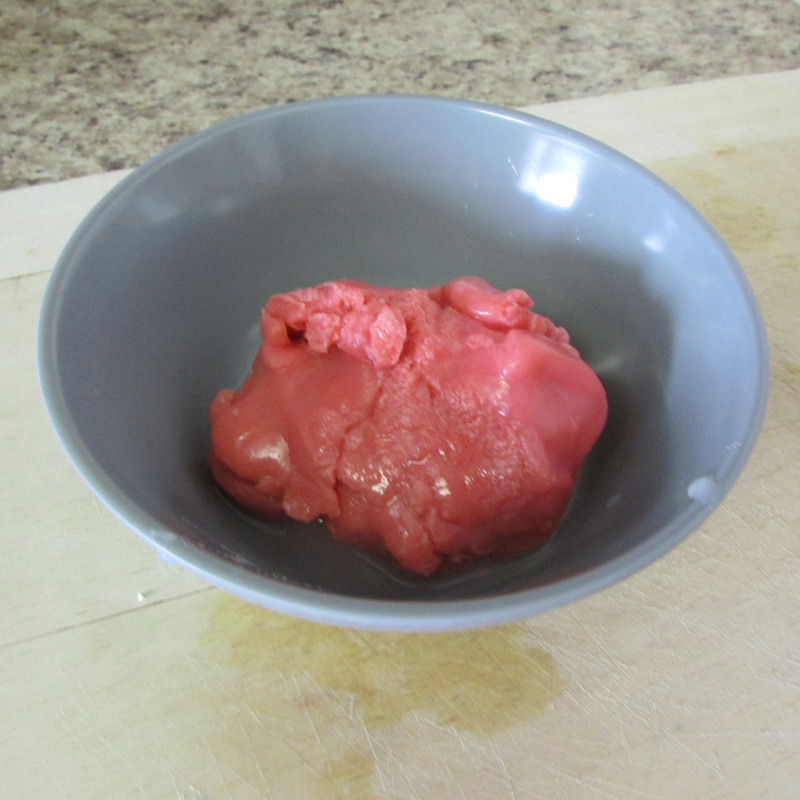 Add the ball of play dough to the bowl and roll it around, kneading the dough with your fingers so that you soak up all of the liquid into the dough. 4. Take the dough out of the bowl and knead with your hands for a minute until it starts to feel softer and less wet. 5. Pop it in the microwave for 20 seconds. 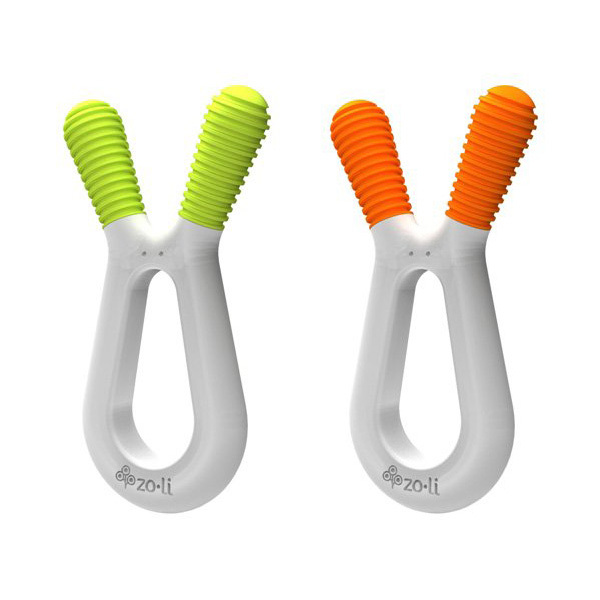 Then just squish in your hands a couple times and it will feel soft and ready to play with again! No need to ever toss dried play dough again! Hooray! 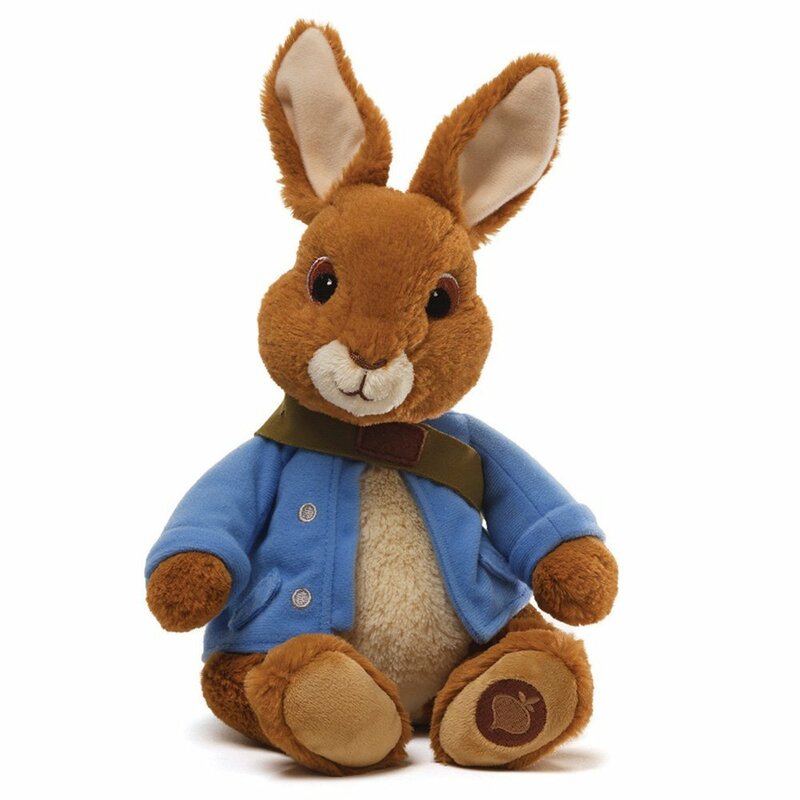 Easter baskets are a cute way to surprise your little buddy with some sweet gifts & treats. I don’t like to give T too much sugar (or he turns into a hyperactive, moody, whirlwind of destruction) but there are plenty of other cute ways to fill his basket. 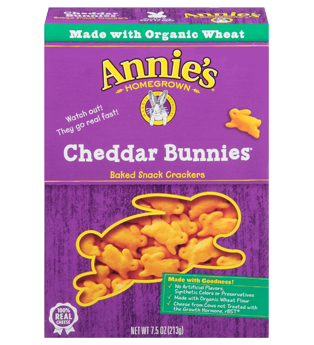 Annie’s Homegrown Snacks: These are the yummiest little cheddar crackers, graham crackers, cookies, pretzels and fruit snacks you ever did see- all shaped like bunnies, made from organic indregients, and some are even gluten-free! Perfect for a healthy and tasty Easter treat. 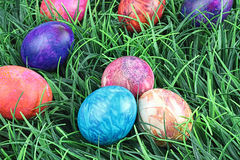 Hard-Boiled Eggs: Why not have your kid actually eat some of those Easter eggs that you dyed together? 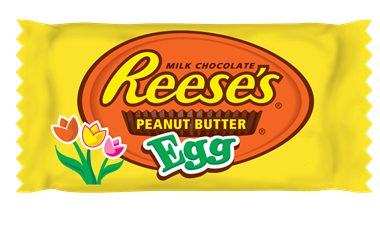 Reese’s Peanut Butter Egg: I know it’s candy… but Reese’s are the best, and you can buy just one egg if you want to. 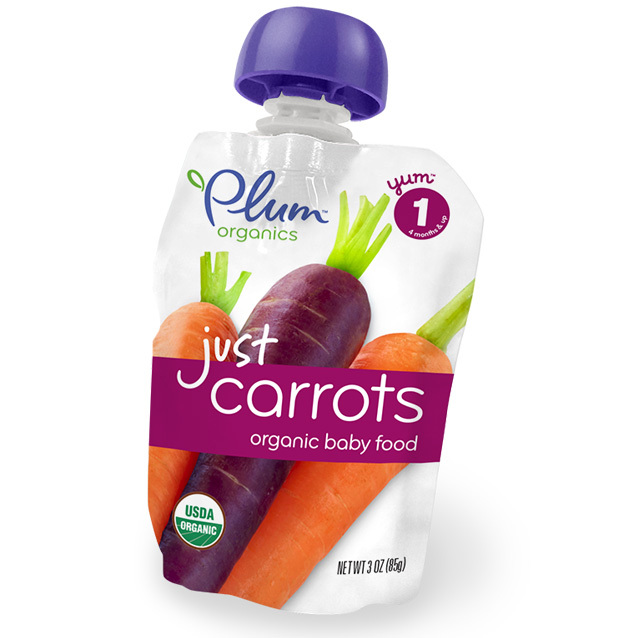 Plus, they are soft and easy to chew for someone who might not have all of their molars in yet. 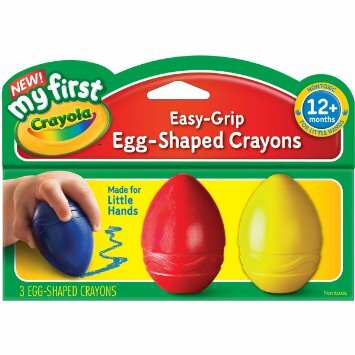 Egg-Shaped Crayons & Coloring Pages: It would be a fun surprise to get these little egg-shaped crayons and then print out a bunch of free Easter coloring pages. Thanks Crayola! 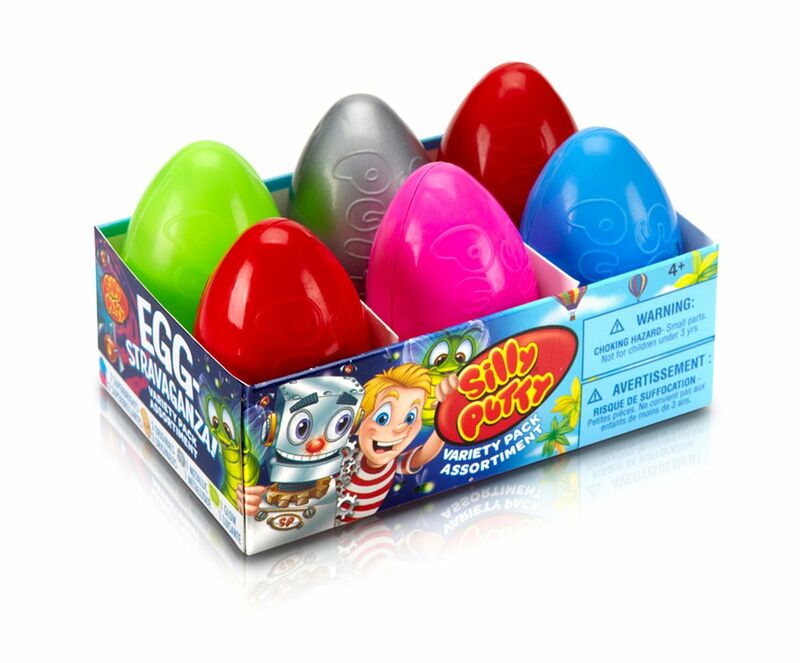 Silly Putty: Another fun egg-shaped present that is sure to entertain a tot! 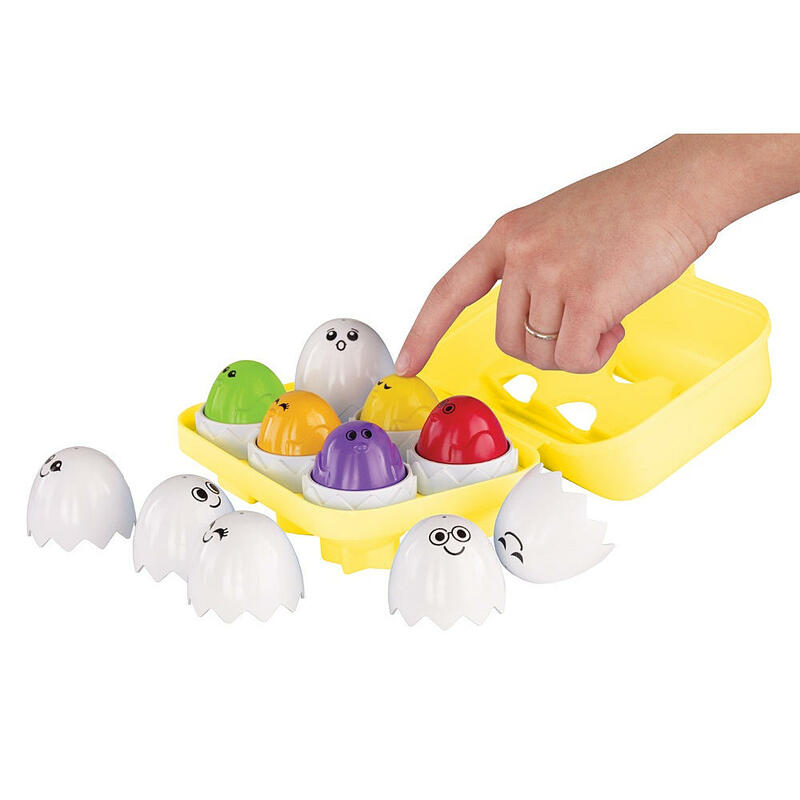 Peek n’ Peep Egg Toy: Fun, educational, and egg-shaped! 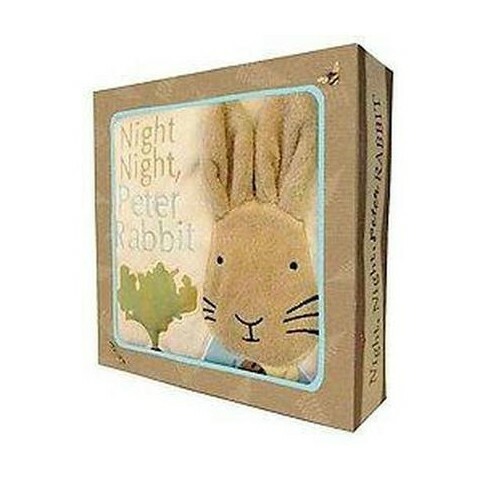 Plush Peter Rabbit: This cute and squeezable stuffed bunny would make a great pal for a boy or a girl. 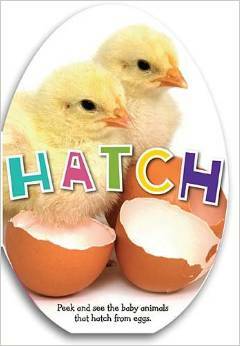 Hatch (Lift-the-Flap Book) by Katie Cox: You lift the flaps to see different baby animals “hatch” out of their eggs. Very fun! 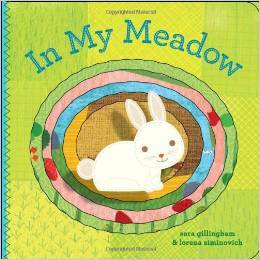 In My Meadow by Sara Gillingham (Author) & Lorena Siminovich (Illustrator): This book has cute die-cut pages and a bunny finger puppet! 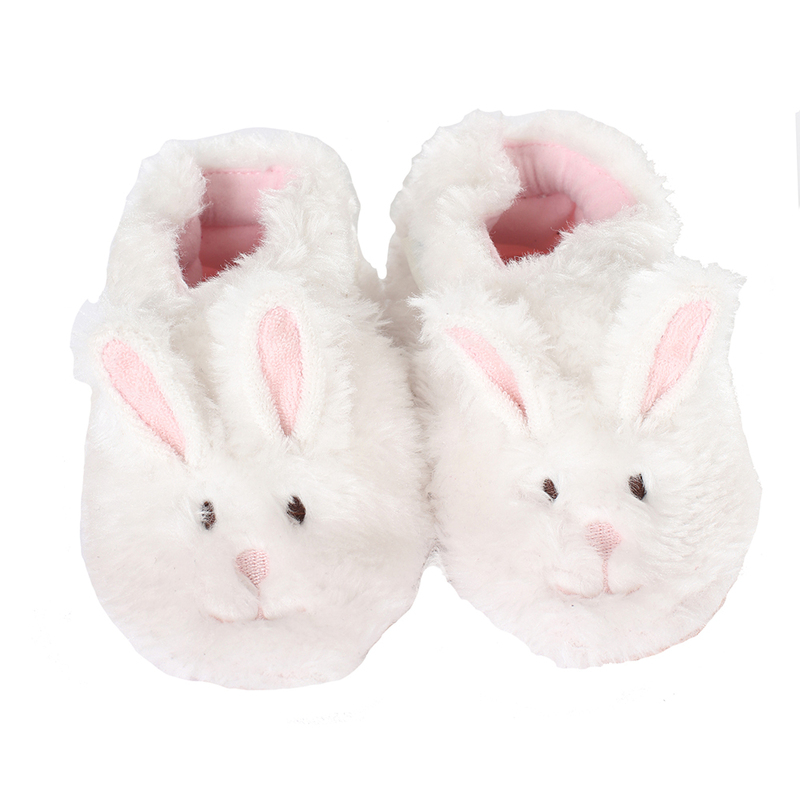 Fuzzy Bunny Slippers: These precious Robeez slippers come in pink, too! They also make bear slippers that are equally cute and a little less feminine. 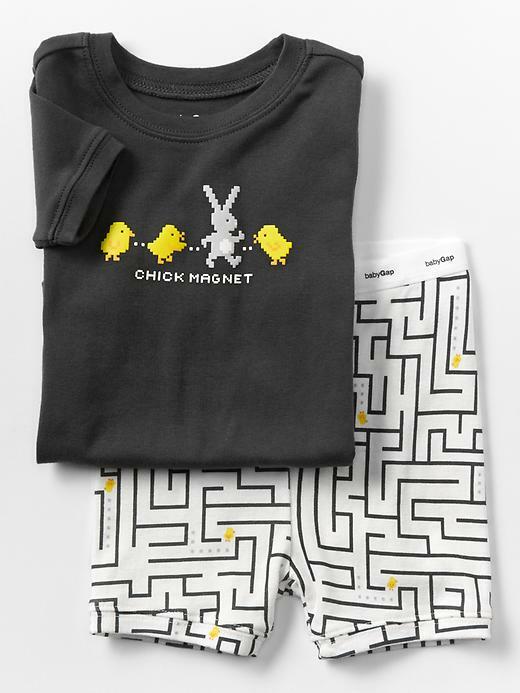 Chick Magnet Pajamas (Boy): Baby Gap. 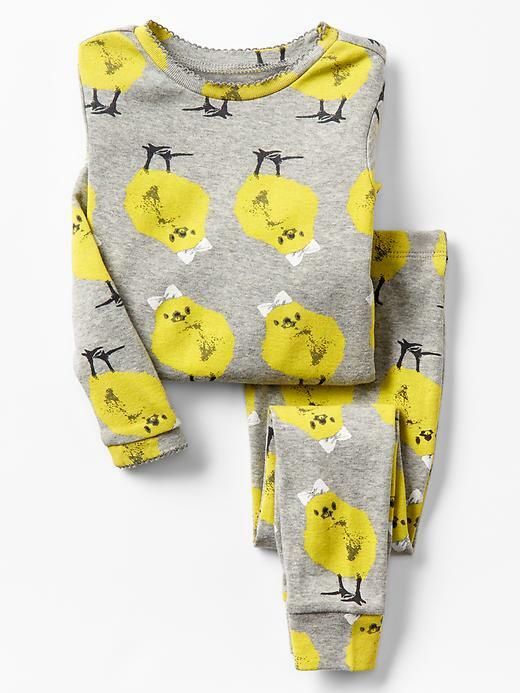 Seriously, how adorable are these PJs? I already ordered them for T! Bubbles: Because what would be sweeter than a photo of T dressed up in his Easter Sunday best, running through bubbles on a sunny spring day? Pinwheels: Inexpensive, festive, colorful, and fun to decorate the garden. 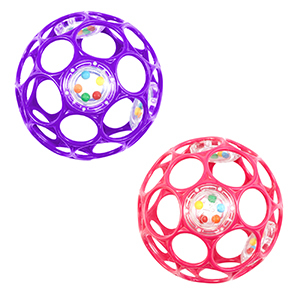 Light-up bouncy balls: We put a couple of these in his Easter basket last year and he still plays with them every day! 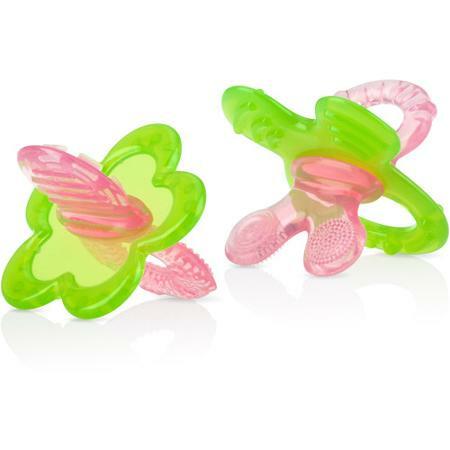 Pacifiers: I especially love these ones by Ulubulu that come in all sorts of cute colors, have funny expressions you can choose from, or you can personalize with baby’s name. 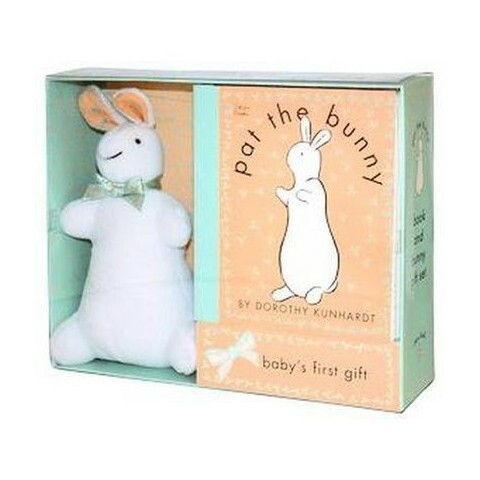 What do you plan to include your toddler’s or baby’s Easter basket this year? Share your favorite items with us!